From The Editor- "April Breezes" by Luis Ayala. The Angel’s Share - Paul Senft reviews Havana Club Añejo 3 Años and Havana Club Añejo Blanco. Cooking with Rum- Chef Susan Whitley shares with us two delicious appetizers you can enjoy with your friends and family outdoors while enjoying the spring season: Spicy Rum Meatballs and Rum Puppies. Bon Appetit! Rum University Fermentation Primer- The Rum University offers Part IV of a series devoted to the world of fermentation. Muse of Mixology - Cris Dehlavi brings us "Puerto Rico: Welcome Caribe" where she talks about her recent trip to Puerto Rico, the story of Joe Scialom and shares with us some cocktails created by Joe Scialom, as well as, a Caribe welcome cocktail. Cheers! The Rum University Library- The Rum University shares a publishers review of "101 Mojitos & Other Muddled Drinks" written by Kim Haasarud. The Rum Biography- The Rum University presents a series of people who have made a difference in the world of rum. This month's issue features the history of Hans von Euler-Chelpin. The Rum Historian- Marco Pierini brings us his article called "And if it were the French Caribbean the First Cradle of Rum? Part 6. Conclusion: The Cradles of Rum". The Cocktail Scientist - Joel Lackovich, The Cocktail Scientist, will be exploring cocktails from a scientific perspective. This month's cocktail is: The Traditional Mojito. Rum in the News- Mike Kunetka brings us the most recent and noteworthy news in the rum industry. 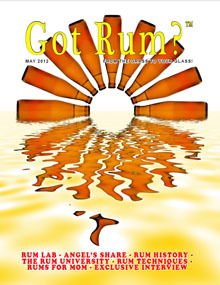 Exclusive Interview- Margaret Ayala, Publisher of "Got Rum? ", interviews Mr. Michael Kazanowski, Co-Founder and CEO of High Five Spirits in Petoskey, Michigan. Cigar and Rum Pairing- Philip Ili Barake brings us a pairing called "AP Rumtini" where he uses Santa Teresa 1796 rum from Venezuela in a Rumtini cocktail and pairs it with a Magnum 50 cigar from H. Upmann of Cuba. From The Editor- "Marching March" by Luis Ayala. The Angel’s Share - Paul Senft reviews Saint Benevolence Rum and Hampden Estate Single Jamaican Rum. Cooking with Rum- Chef Susan Whitley shares with us a Louisiana classic dessert, but with a twist: Doberge Rum Cake. Bon Appetit! Rum University Fermentation Primer- The Rum University offers Part III of a series devoted to the world of fermentation. Muse of Mixology - In this month's issue Cris Dehlavi, The Muse of Mixology, brings us "The Last Word, With Rum!" where she takes a Prohibition era cocktail known as "The Last Word" and substitutes the gin for rum. Cheers! The Rum University Library- The Rum University shares a publishers review of "Obituary Cocktail - The Great Saloons of New Orleans" written by Kerri McCaffery. The Rum Biography- The Rum University presents a series of people who have made a difference in the world of rum. This month's issue features the history of Eduard Alois Buchner. The Rum Historian- Marco Pierini brings us this month his article called "And if it were the French Caribbean the First Cradle of Rum? Part 5. Sailor, Soldier, Writer, Fray: Jean Baptiste Du Tertre". Mardi Gras Special - "Got Rum?" brings us a brief overview of Mardi Gras in Louisiana. The Cocktail Scientist- "Got Rum?" is excited to bring you our newest contributing writer, Mr. Joel Lackovich. He will be exploring cocktails from a scientific perspective. Cigar and Rum Pairing- Philip Ili Barake brings us a pairing called "Fresh Old Fashioned" where he uses Bayou Rum Select from Louisiana to make a rum-based Old Fashioned and pairs it with a Quorum Classic Double Gordo cigar from Nicaragua. From The Editor- "The Pursuit of Sweetness" by Luis Ayala. The Angel’s Share - Paul Senft reviews Gosling’s Papa Seal and Lola Belle Cherry Rum. Cooking with Rum- Chef Susan Whitley shares with us two recipes that are sure to make your loved one feel extra special this Valentine's Day: Dark Chocolate Truffles with Rum Liqueur and Rum Liqueur and Chocolate Creams. Bon Appetit! Rum University Fermentation Primer- The Rum University offers Part II of a series devoted to the world of fermentation. Muse of Mixology - In this month's issue Cris Dehlavi, The Muse of Mixology, brings us "Shaken or Stirred?l" where she explains the difference between shaking a cocktail and stirring it as well as which cocktails should be shaken and not stirred. Cheers! The Rum University Library- The Rum University shares a publishers review of "Dark Tide - The Great Boston Molasses Flood of 1919" written by Stephen Puleo. The Rum Biography- The Rum University presents a series of people who have made a difference in the world of rum. This month's issue features the history of Hermann Emil Louis Fischer. The Rum Historian- Marco Pierini brings us this month his article called "And if it were the French Caribbean the First Cradle of Rum? Part 4. Of Mice and Rum". Valentine's Day Special - "Got Rum?" brings us Romantic Rum Cocktails. Exclusive Interview- Margaret Ayala, publisher of "Got Rum?" interviews Mr. Toby Tyler, Master Blender and Rum Blending Consultant, located in Harbour Island, Bahamas. Cigar and Rum Pairing- Philip Ili Barake brings us a pairing called "Sangría" where he uses Ron Brugal XV Reserva Exclusiva in a Sangria cocktail along with a Gordito cigar from the Perdomo line. From The Editor- "Last but not Yeast" by Luis Ayala. The Angel’s Share - Paul Senft reviews Bacardi Añejo Cuatro and Havana Club Ritual. Cooking with Rum- Chef Susan Whitley shares with us two Eggnog Éclair desserts. Bon Appetit! Rum University Fermentation Primer- The Rum University offers Part 1 of a series devoted to the world of fermentation. Muse of Mixology- In this month's issue Cris Dehlavi, The Muse of Mixology, brings us "Corn and Oil" where she offers a little history and recipe for this cocktail. Cheers! The Rum University Library- The Rum University shares a publishers review of "Ratoon Stunting Disease (RSD) of Sugarcane" written by Syed Zia-ul-Hussnain, Shahid Afghan and Khalid Hussain. The Rum Biography- The Rum University presents a series of people who have made a difference in the world of rum. This month's issue features the history of August Kekule von Stradonitz. The Rum Historian- Marco Pierini brings us this month his article "And if it were the French Caribbean the First Cradle of Rum? Part 3: The Business of Distilling in France". Exclusive Interview- Margaret Ayala, publisher of "Got Rum?" interviews Mr. Karthik Sudhir, Founder and CEO of Phenomenal Spirits. Cigar and Rum Pairing- Philip Ili Barake brings us a pairing called "Stepfather Pairing" where he pairs a Stepfather cocktail, using Havana Club 7 year old rum, along with a Romeo and Julieta Robusto, named “Short Churchill”, cigar. From The Editor- "Rum Lexicon" by Luis Ayala. The Angel’s Share - Paul Senft reviews Three Sheets Barrel Aged Rum and Foursquare Exceptional Cask 2005. Cooking with Rum- Chef Susan Whitley shares with us a soup and main course that are sure to keep you warm during the winter months: Rum Consommé and Duck with Rum Marinade. Bon Appetit! Rum University Laboratory- The Rum University offers a recipe on how to make your own Blackberry Rum Liqueur. Muse of Mixology - In this month's issue Cris Dehlavi, The Muse of Mixology, brings us "Time To Warm Up!" where she offers three cocktails, two that are served hot and one served cold. Cheers! The Rum University Library- The Rum University shares a publishers review of "DIY Bitters" written by Herbalists, Guido Mase and Jovial King. Rum and the Environment- For the past few months we have been asking rum distillers, brand owners and Ambassadors to submit to us information on how they are helping out the environment. In this last edition for 2018 we have selected four winners that stood out from all the rest. We present you "The 2018 Rum and the Enviroment Awards". The Rum Biography - The Rum University presents a series of people who have made a difference in the world of rum. This month's issue features the history of George Babcock and Steven Wilcox. The Rum Historian- Marco Pierini brings us this month his article called "And if it were the French Caribbean the First Cradle of Rum? 2. Adam's Will". "Got Rum?" Team Interview- Margaret Ayala, publisher of "Got Rum?" interviews the entire "Got Rum?" Team along with an exclusive interview from Mr. Mike Kunetka who interviews Luis and Margaret Ayala. Cigar and Rum Pairing - Philip Ili Barake brings us a pairing called "Reserva Limitada Pairing" where he pairs a Bacardi Gran Reserva Limitada Rum,used in an Old Fashioned cocktail, along with a Champagne Noir cigar from Perdomo Reserve. From The Editor- "Is Rhum Agricole Under Siege?" by Luis Ayala. The Angel’s Share - Paul Senft reviews Pixie Spiced Rum and Single Cane Estate-Consuelo. Cooking with Rum- Chef Susan Whitley shares with us a traditional Martinique dish with a Rhum Agricole twist to it called "Chicken Colombo with Rhum". Bon Appetit! Rum University Laboratory- The Rum University offers a recipe on how to make your own Martinican Punch Coco. Muse of Mixology - In this month's issue Cris Dehlavi, The Muse of Mixology, brings us "Rhum Cocktails" where she offers three cocktails using Rhum Agricole. 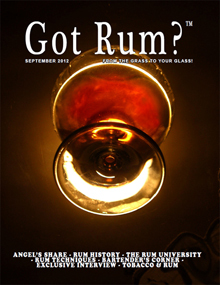 Rhum Agricole- In this month's issue, "Got Rum?" takes its readers on a journey in the Rhum Agricole world. The Rum Biography- The Rum University presents a series of people who have made a difference in the world of rum. This month's issue features the history of Antonie van Leeuwenhoek. The Rum Historian- Marco Pierini brings us this month his article called "And if it were the French Caribbean the First Cradle of Rum? 1. Saint Christophe, Martinica and Eau-de-Vie". Rum and the Environment- This is a shout out to all rum distillers, brand owners and Ambassadors. We are asking for each to submit information on how they are helping out the environment. Exclusive Interview- Margaret Ayala, publisher of "Got Rum?" interviews once again Mr. Marc Sassier, Oenologist for Saint James in Martinique. Cigar and Rum Pairing- Philip Ili Barake brings us a pairing called "Cuban Spirits Pairing" where he pairs a 2014 harvest Cohiba Robusto with a Ron Añejo Superior Santiago de Cuba 11 year old rum. From The Editor- "OMG it is OND!" by Luis Ayala. The Angel’s Share - Paul Senft reviews Sugar Skull Tribal Rum and Trader Vic’s 151. Cooking with Rum- Chef Susan Whitley shares with us Spooky “Intestines” Stuffed with Chorizo and Caramelized Onions that is sure to creep out your Halloween guests. Bon Appetit! Rum University Laboratory- The Rum University offers a recipe on how to make your own pumpkin wine. Muse of Mixology - In this month's issue Cris Dehlavi, The Muse of Mixology, brings us "Spooky Halloween Cocktails" where she offers three Halloween themed cocktails. The Rum University Library- The Rum University shares the publishers review of "Halloween cocktails adults only" written by Tetiana Myrhorodska. Spooky Cocktails- "Got Rum?" offers some ideas on how to impress your Halloween guests along with some great cocktails that are sure to please them as well. The Rum Biography- The Rum University presents a series of people who have made a difference in the world of rum. This month's issue features the history of Charles Cagniard de la Tour. The Rum Historian - Marco Pierini brings us this month his article called "The Origins of Alcoholic Distillation in the West: 9. The Business of Distilling. Exclusive Interview- Margaret Ayala, publisher of "Got Rum?" interviews Mr. Brian Restall, Founder of Lord Byron Distillery located in Byron Bay, Australia. Around the Rum World- Mr. Carl Kanto brings us a recap of the recent 18th edition of Spirits Selection by Concours Mondial de Bruxelles which took place in Plovdiv, Bulgaria. Cigar and Rum Pairing - Philip Ili Barake brings us a pairing called "Short Straight" where he pairs a Serie D N°6 cigar, produced by Partagás from Cuba, along with Mount Gay Extra Old from Barbados and Santa Teresa 1796 from Venezuela. From The Editor- "Garnishers and Garnishes" by Luis Ayala. The Angel’s Share - Paul Senft reviews Plantation Xaymaca Extra Dry and Foursquare Rum Distillery Exceptional Cask Dominus. Cooking with Rum- Chef Susan Whitley shares with us a main course, Spirited Filet Mignon, along with a Rum Cheesecake for dessert. Bon Appetit! Rum University Laboratory- The Rum University offers a recipe on how to make your own paper from sugarcane bagasse. Muse of Mixology - In this month's issue Cris Dehlavi, The Muse of Mixology, brings us "Cocktail Garnishes....too much or too little?" where she talks about elaborate vs. simple garnishes. The Rum University Library- The Rum University shares the publishers review of "The Cocktail Garnish Manual" written by Philippe Tulula. The Art of the Cocktail Garnish- Margaret Ayala, publisher of "Got Rum?" magazine, brings us "Introduction to Cocktail Garnishes" where she talks about the difference between organic and artificial garnishes. The Rum Biography- The Rum University presents a series of people who have made a difference in the world of rum. This month's issue features the history of Christian Ehrenfried Weigel. The Rum Historian - Marco Pierini brings us this month his article called "The Origins of Alcoholic Distillation in the West: 8. From Apothecary to Tavern. Exclusive Interview- Margaret Ayala, publisher of "Got Rum?" interviews Mrs. Karen Hoskin, co- founder, co-owner, and CEO of Montanya Distillers located in Crested Butte, Colorado. Cigar and Rum Pairing - Philip Ili Barake brings us a pairing called "Rusty Hook" where he pairs a cocktail using Ron Brugal Extra Viejo from the Dominican Republic with a Robusto cigar from the “Yellow Series” line from the Tatascan brand from Honduras. From The Editor- "Training for Gold" by Luis Ayala. The Angel’s Share - Paul Senft reviews Rhum Barbancourt Estate Reserve 15 and Ron Santa Teresa 1796. Cooking with Rum- Chef Susan Whitley shares with us a main course: Spirited Creamy Coconut Shrimp on Coconut Rice. Bon Appetit! Rum University Laboratory- The Rum University offers a recipe on how to make your own Coconut Palm Wine (Tuba). Craft Shop- In this month's issue Margaret Ayala, publisher of "Got Rum? ", shares with us a recipe on how to make your own coconut soap. A Coconut Special- this month's issue is dedicated to coconuts. In this section you will learn interesting facts about coconuts, a puertorican favorite cocktail recipe for Coquito as well as some delicious cocktail recipes. The Rum University Library- The Rum University shares the publishers review of "Listening to Scent" written by Jennifer Peace Rhind. Rum and Glassware, Part V- This month Luis Ayala, Editor of "Got Rum? ", completes a series dedicated to the importance of glassware in the spirits industry. The Rum Biography- The Rum University presents a series of people who have made a difference in the world of rum. This month's issue features the history of Charles Alfred Barber. The Rum Historian - In this month's article called "The Origins of Alcoholic Distillation in the West: 7. A First for Italy: The Water of Life from Modena, Marco Pierini talks about the influence the ancient town of Modena had on alcoholic distillation. Paul's Spirited Travel- Paul shares with us a recap of the recent Tales of the Cocktail held in New Orleans, Louisiana. Exclusive Interview- Margaret Ayala, publisher of "Got Rum?" interviews Mr. Andrew Starnes, distiller at Rusted Crow Spirits in Michigan. Cigar and Rum Pairing- Philip Ili Barake brings us a pairing called "Dry Rumtini" where he pairs a rum-based Martini using Port Mourant, White Guyana Pure Single Rum, along with a Torpedo 1881 Perique cigar from Tabacalera Incorporada. From The Editor- "United in our Differences" by Luis Ayala. The Angel’s Share - Paul Senft reviews St. Augustine Rum and Rum-Bar Gold. Cooking with Rum- Chef Susan Whitley shares with us a main course and side dish you can enjoy this summer: Hawaiian Ribeyes with Rum Chutney and Spirited Corn-on-the-Cob. Bon Appetit! Rum University Laboratory- The Rum University offers a recipe on how to make your own Black Tea and Rum Liqueur. The Muse of Mixology- Cris Dehlavi brings us "Nui Nui!" where she shares with us a Nui Nui cocktail recipe as well as a Vanilla-Cinnamon Simple Syrup. Cheers! The Drinks of Summer!- "Got Rum?" offers numerous refreshing cocktails to help you beat the summer heat. The Rum University Library- The Rum University shares the publishers review of "Summer Cocktails" written by María Del Mar Sacasa. Rum and Glassware, Part IV- This month Luis Ayala, Editor of "Got Rum? ", continues a series dedicated to the importance of glassware in the spirits industry. The Rum Biography- The Rum University presents a series of people who have made a difference in the world of rum. This month's issue features the history of Frederick Bates. 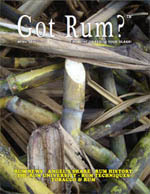 The Rum Historian - In this month's article called "The Origins of Alcoholic Distillation in the West: 6. From Charity to Business: Taddeo Alderotti”, Marco Pierini talks about Taddeo Alderotti and his important role in alcoholic distillation. Exclusive Interview- Margaret Ayala, publisher of "Got Rum?" interviews Mr. Dave Willis, Head Distiller, of Bully Boy Distillers located in Massachusetts. Cigar and Rum Pairing - Philip Ili Barake brings us a pairing called "Apple Darktini" where he pairs an Epicure cigar from Perdomo Cigars and pairs it with an Appletini cocktail using Ron Botrón Reserva Añejo. From The Editor- "The Power of Smell" by Luis Ayala. The Angel’s Share - Paul Senft reviews Clairin Casimir Rum and Foursquare Exceptional Cask Premise. Cooking with Rum- Chef Susan Whitley shares with us a main course and side dish that is sure to make your father feel extra special on Father's Day: Baked Rummy Pork Chops and Apples and Rummy Mashed Potatoes. Bon Appetit Dads! Rum University Laboratory- The Rum University offers a recipe on how to make your own Pear and Thyme Rum Liqueur. A Father's Day Special - Here are some great gift ideas for the rum loving Dads in your life. The Muse of Mixology- Cris Dehlavi brings us "Fog Cutter" where she shares with us three different Fog Cutter recipes. Cheers! The Rum University Library- The Rum University shares the publishers review of "Michael Owens and the glass industry" written by Quentin R. Skrabec, Jr.
Rum and Glassware, Part III- This month Luis Ayala, Editor of "Got Rum? ", continues a series dedicated to the importance of glassware in the spirits industry. The Rum Biography- The Rum University presents a series of people who have made a difference in the world of rum. This month's issue features the history of Michael J. Owens. The Rum Historian - In this month's article called "The Origins of Alcoholic Distillation in the West: The Water of Life and the Franciscan Friars”, Marco Pierini talks about how the friars described the numerous medicinal waters that were by that time commonly used in medicine, including the production of alcohol, with distillation of both essences for making rosewater and wine for the production of "aqua vitae". Exclusive Interview - Margaret Ayala, publisher of "Got Rum?" interviews Mr. Andy Keller, Head Distiller and Production Manager, at Blackwater Distilling located in Stevensville, Maryland. Cigar and Rum Pairing- Philip Ili Barake brings us a pairing called "The Brown Manhattan" where he takes a simple and easy to make recipe using Santa Teresa Gran Reserva 1796 Rum, Vermouth Rosso and Coffee Liqueur and pairs it with a Churchill cigar from Carlos Toraño’s “The Brick” line. From The Editor- "In May" by Luis Ayala. The Angel’s Share - Paul Senft reviews Koloa Kaua’I Coffee Rum and Maggie’s Farm Queen’s Share Bourbon Barrel Aged Rum. Cooking with Rum- Chef Susan Whitley shares with us a recipe that is sure to make your Mother feel extra special this month. Start her day with Rum-Soaked Texas French Toast. Bon Appetit! Rum University Laboratory- The Rum University offers a recipe on how to make your own Blackberry Basil Rum Liqueur. A Mother's Day Special - Here is a little history about Mother's Day throughout the world. 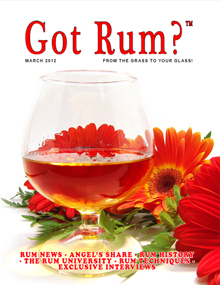 Gift Ideas for Mom- In this month's issue, Margaret Ayala, publisher of "Got Rum? ", shares with us some gift ideas for rum loving Moms. The Muse of Mixology- Cris Dehlavi brings us "Rum Sour" where she shares with us three recipes of rum sour using very different styles of rum. Cheers! The Rum University Library- The Rum University shares the publishers review of "Glass: A Short History" written by David Whitehouse. Rum and Glassware, Part II- This month Luis Ayala, Editor of "Got Rum? ", continues a series dedicated to the importance of glassware in the spirits industry. The Rum Biography - The Rum University presents a series of people who have made a difference in the world of rum. This month's issue features the history of Dmitri Mendeleev. The Rum Historian- In this month's article called "The Origins of Alcoholic Distillation in the West: The Medical School of Salerno”, Marco Pierini talks about the founding of a medical school based on Greek, Latin, Arab and Jewish culture and one of the earliest writings discussing alcohol distillation. Cigar and Rum Pairing - Philip Ili Barake brings us a pairing called "Black Dessert" where he takes a previous recipe called Black Pirate and incorporates a bitter chocolate mousse with mint dessert and pairs it with Zafra 21 Rum from Panama along with a Partagas Serie D N°5 cigar. From The Editor- "Rum Festival Season" by Luis Ayala. The Angel’s Share - Paul Senft reviews Vanûa and Caroni 2000 rums. Cooking with Rum- Chef Susan Whitley shares with us two recipes that are sure to start your mornings off on the right foot: Rum Cinnamon Rolls and Rum and Coffee Parfait. Bon Appetit! Rum University Laboratory- The Rum University offers a recipe on how to make your own Apple Cinnamon Rum Liqueur. The Muse of Mixology- Cris Dehlavi brings us "Central Ohio Rum Society (CORS)" where she interviews Mr.Chad White, Founder of CORS. Cheers! The Rum University Library- The Rum University shares the publishers review of "Flavor: The Science of Our Most Neglected Sense" written by Bob Holmes. Rum and Glassware, Part I- This month Luis Ayala, Editor of "Got Rum? ", begins a series dedicated to the importance of glassware in the spirits industry. The Rum Biography- The Rum University presents a series of people who have made a difference in the world of rum. This month's issue features the history of Alexander Fleming. The Rum Historian - In this month's article called "The Origins of Alcoholic Distillation in the West: The Arabs”, Marco Pierini takes us on a journey into the history of the influence of the Arabs in distillation. Exclusive Interview- Margaret Ayala, publisher of "Got Rum?" interviews Mr. Victor Olshansky, Founder and CEO of Florida Rum Company located in Hollywood, Florida. Cigar and Rum Pairing - Philip Ili Barake brings us a pairing called "Chirimoya (Custard Apple) Daiquiri" where he makes several attempts at a twist on the Daiquiri and finally comes up with the winner using Chirimoya (Custard Apple) with a Rhum Agricole, Rhum Blanc by Rhum J.M. He then pairs this cocktail with a Short Churchill from Romeo y Julieta. From The Editor- "USA Craft Beverage Modernization and Tax Reform" by Luis Ayala. The Angel’s Share - Paul Senft reviews Diplomatico Mantuano and Ron Viejo de Caldas Gran Reserva rums. Cooking with Rum- Chef Susan Whitley shares with us a King Cake recipe to celebrate Mardi Gras only this cake is extra special since it includes rum, a slight step away from the traditional King Cake. Bon Appetit! Rum University Laboratory- The Rum University offers a recipe on how to make your own Cafe Noir (Coffee and Chicory). The Rum University- Coverage of the recent Rum University 5-Day Rum Course that took place in Louisville, Kentucky at the Moonshine University February 19th - 23rd of 2018. Congratulations graduates! The Muse of Mixology- Cris Dehlavi brings us "Laissez les bons temps rouler!!" (Let the good times roll!) where she offers us several Mardi Gras cocktail recipes. Cheers! The Rum University Library- The Rum University shares an Amazon Review of "New Orleans Cocktails" written by Sarah Baird. Mardi Gras- This month Luis Ayala, Editor of "Got Rum? ", brings us some Mardi Gras trivia, Mardi Gras classic cocktails and a map of Louisiana craft distilleries. The Rum Biography - The Rum University presents a series of people who have made a difference in the world of rum. This month's issue features the history of Louis-Camille Maillard. The Rum Historian- In this month's article called "The Origins of Alcoholic Distillation in the West: Alexandria”, Marco Pierini takes us on a journey into the history of distillation in Alexandria. Cigar and Rum Pairing- Philip Ili Barake brings us a pairing called "Hurricane, Cigar Version" where his inspiration comes from the famous Hurricane cocktail associated with Mardi Gras celebration. In this month's pairing, Philip takes a slight twist on the Hurricane recipe so that it pairs nicely with a Trinidad Coloniales cigar. From The Editor- "The Unlimited World of Rum" by Luis Ayala. The Angel’s Share - Paul Senft reviews Spytail Black Ginger Rum and Deadhead Dark Chocolate Rum. Cooking with Rum- Chef Susan Whitley shares with us a Valentine's Day special recipe called Sweet Lovers Chocolate Layered Rum Cake with Rum Cream Cheese Frosting. Bon Appetit! Rum University Laboratory- The Rum University offers a recipe on how to make your own Chocolate Covered Coffee Beans. The Rum University- The Rum University will have its next 5-Day Rum Course in Louisville, Kentucky at the Moonshine University February 19th - 23rd of 2018. The Muse of Mixology- Cris Dehlavi brings us "For the Love of Rum" where she offers us several Valentine's Day cocktail recipes sure to make your loved one feel extra special. Cheers! The Rum University Library- The Rum University shares an Amazon Review of "The Art of Fermentation" written by Sandor Ellix Katz. 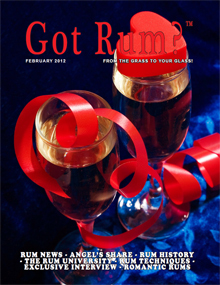 Valentine's Day Special- This month Luis Ayala, Editor of "Got Rum? ", brings us some delicious cocktail recipes called "Rum Cocktail for Lovers". The Rum Biography- The Rum University presents a series of people who have made a difference in the world of rum. This month's issue features the history of Aeneas Coffey. The Rum Historian - In this month's article called "The Origins of Alcoholic Distillation in the West: A New Quest”, Marco Pierini takes us on a new journey into the history of distillation. Exclusive Interview- Margaret Ayala, publisher of "Got Rum?" interviews Mr. Trevor Bruns, founding member of Whistler African Style Rum. Cigar and Rum Pairing - Philip Ili Barake brings us a pairing called "Apple Rumtini Cocktail" where he uses Ron de Jeremy rum in an apple martini cocktail and pairs it up a Robusto from the La Ley Cigars portfolio from Nicaragua. From The Editor- "Crystal Clear, or is it?" by Luis Ayala. The Angel’s Share - Paul Senft reviews Savannah Spirits Silver Rum and Rum Dog Rum. Cooking with Rum- Chef Susan Whitley shares with us two recipes to help you ring in the new year: Spirited Chipped Beef and New Years Rum Twists. Bon Appetit! Rum University Laboratory- The Rum University offers a recipe on how to make your own Rum Krupnik. The Rum University- The Rum University will have its next 5-Day Rum Course in Louisville, Kentucky at the Moonshine University February 19th - 23rd of 2018. Time is running out for the Early Bird Special where you get FREE hotel stay if you register BEFORE January 8th. 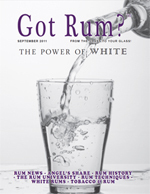 White Rum Special- This month Luis Ayala, Editor of "Got Rum? ", takes us on the journey of the rum industry's cornerstone, White Rum. The Rum Biography - The Rum University presents a series of people who have made a difference in the world of rum. This month's issue features the history of Jean Baptiste Labat. The Rum Historian- In this month's article called "American Rum 27: Demon Rum”, Marco Pierini talks about the temperance movement. Exclusive Interview- Margaret Ayala, publisher of "Got Rum?" interviews Mr. Edgar Sanchez Wilke, Founder of Costa Rican Rum Company (Ron Jaguar). Cigar and Rum Pairing- Philip Ili Barake brings us a pairing called "Special Ice Tea Pairing" where he uses Angostura 1824 from Trinidad in an iced tea and pairs it up along with a Romeo y Julieta Short Churchill Cigar from Cuba. From The Editor- "Gratitude and Toasts" by Luis Ayala. The Angel’s Share - Paul Senft reviews Two James Doctor Bird Jamaican Rum and Criterion. Cooking with Rum- Chef Susan Whitley shares with us an easy and delicious hors d'oeuvre called Nuts and Rum Ground Chicken Spread which will go great with a Holiday Spiced Eggnog . Bon Appetit! The Rum University - The Rum University shares with us part 19 of a series on "Ideas That Changed the Rum World". This month's topic is Ice. Rum University Laboratory - The Rum University offers a recipe on how to make your own Anise Liqueur (Anisette). Rum University- The Rum University will have its next 5-Day Rum Course in Louisville, Kentucky at the Moonshine University February 19th - 23rd of 2018. Sign up today and get your hotel stay for FREE. The Muse of Mixology- Cris Dehlavi brings us "Holiday Eggnog and Milk Punch" where she offers us two recipes: Homemade Eggnog and Tom & Jerry. Cheers! Eggnog Special- This month we delve into the wonderful world of Eggnog! Helping the Rebuilding Effort- Due to the recent chain of hurricanes that devastated much of the Caribbean and North America, the "Got Rum?" team shares some tips on how you can lend a helping hand. The Rum Historian - In this month's article called "American Rum 26: The Decline and Fall of American Rum”, Marco Pierini talks about the decline of the rum industry and the rise of whiskey. Holiday Rum Shopping Guide- Paul Senft gives us some great holiday gift ideas for the rum lovers in our lives. The Rum University Library- The Rum University shares an Amazon Review of "A Christmas Cookbook: 40 Eggnog Recipes" written by Daniel Humphreys. Rum in History- A timeline of events that occurred during the month of December throughout history. Exclusive Interview- Margaret Ayala, publisher of "Got Rum?" interviews the entire team of "Got Rum?". Cigar and Rum Pairing - Philip Ili Barake brings us a pairing called "Fresh Fusion" where he uses Elixir 33 from Cuba Ron SA (Cuba), Myers’s Jamaica Rum, Fever Tree’s Ginger Beer and a fresh sprig of mint to make a "Stormy Mojito" which he then uses to pair along with a Coloniales de Trinidad cigar. From The Editor- "Balance" by Luis Ayala. The Angel’s Share - Paul Senft reviews Saint James Cuvée 1765 and Clément VSOP. Cooking with Rum- Chef Susan Whitley shares with us a main course dish called Sirloin Steak with Rum Sauce and for dessert a delicious Caramelized Sugar and Rum Pudding. Bon Appetit! The Rum University - The Rum University shares with us part 18 of a series on "Ideas That Changed the Rum World". This month's topic is Flavoring and Blending. Rum University Laboratory - The Rum University offers a recipe on how to make your own flavored sugar cubes. The Muse of Mixology- Cris Dehlavi brings us "Rhum Agricole Cocktails 101" where she offers us two recipes using rhum agricole: Rhum Daiquiri and Rhum Sidecar. Cheers! Book Review- Luis Ayala, Editor of "Got Rum? ", reviews a recently published rum book called "American Rum" written by none other than "Got Rum?" Rum Historian, Marco Pierini. The book is available for purchase through Amazon, so make sure to get your copy today. Rhum Agricole- This section is devoted to the world of Rhum Agricoles, also known as French-Style rums. The Rum Historian- In this month's article called "American Rum 25: The Whiskey Rebellion”, Marco Pierini talks about the roles of rum and whiskey during the Whiskey Rebellion. The Rum University Library- The Rum University shares an Amazon Review of "The Whiskey Rebellion" written by William Hogeland. Rum in History- A timeline of events that occurred during the month of November throughout history. Exclusive Interview - Margaret Ayala, publisher of "Got Rum?" interviews Mr. Marc Sassier, Oenologist for Saint James. Cigar and Rum Pairing- Philip Ili Barake brings us a pairing called "Orange Digestif" where he pairs up a Series “D” N°6 Cigar from Partagas with a Santa Teresa Orange Rum Liqueur. From The Editor- "Stubbling, Part 2" by Luis Ayala. The Angel’s Share - Paul Senft reviews DonQ Oak Barrel Spiced Rum and Black Magic Black Spiced Rum. Cooking with Rum- Chef Susan Whitley shares with us a main course dish called Spiced Rum Chicken and Mushrooms and for dessert a delicious Date Spiced Cake. Bon Appetit! Around the Rum World- Mr. Carl Kanto gives us a recap of the recent 17th edition of the Spirits Selection by Concours Mondial de Bruxelles which took place in La Serena, the capital of the Coquimbo region on Chile’s coast. The Rum University - The Rum University shares with us part 17 of a series on "Ideas That Changed the Rum World". This month's topic is Macerations. Rum University Laboratory- The Rum University offers a recipe on how to make your own Vanilla extract. The Muse of Mixology- Cris Dehlavi brings us "Make Your Own Spiced Rum!" where she offers us two recipes: Cable Car and Spiced Rum Infusion. Cheers! Rum and Spices- The Rum University brings us coverage of the intersection between rum and the world of spices. Rum University Library - The Rum University shares a Publisher's Review of "The Spice Companion: A Guide to the World of Spices" written by Lior Lev Sercarz. Helping the Rebuilding Effort - Due to the recent chain of hurricanes that devestated much of the Caribbean and North America, the "Got Rum?" team shares some tips on how you can lend a helping hand. The Rum Historian- In this month's article called "American Rum 24: Temperance”, Marco Pierini talks about the temperance movement. Rum in History- A timeline of events that occurred during the month of October throughout history. Exclusive Interview- Margaret Ayala, publisher of "Got Rum?" interviews Mr. Mark Anderson, CEO and co-founder of Drakes Organic Spirits, LLC. Cigar and Rum Pairing- Philip Ili Barake brings us a pairing called "Count of Montecristo" where he pairs up a Montecristo N°2 cigar with two rums: Pampero Aniversario from Venezuela and El Dorado 15 Year Old Rum from Guyana. From The Editor- "Hurricanes" by Luis Ayala. The Angel’s Share - Paul Senft reviews Endless Summer Rum and Ron Viejo de Caldas 3 Años. Cooking with Rum - Chef Susan Whitley shares with us a main course dish called Ham Loaf with Rum Raisin Sauce and for dessert some delicious Spirited Strawberries. Bon Appetit! The Rum University - The Rum University shares with us part 16 of a series on "Ideas That Changed the Rum World". This month's topic is thermometer. Rum University Laboratory- The Rum University offers a recipe on how to make your own Cranberry and Rum Relish. Rum University- The Rum University will have its next 5-Day Rum Course in Louisville, Kentucky at the Moonshine University February 19th - 23rd of 2018. The Muse of Mixology- Cris Dehlavi brings us "Falernum from Pittsburgh? Yes Please!" where she reviews Maggie's Farm Falernum and offers us two recipes. Cheers! Rum University Library - The Rum University shares a Publisher's Review of "Start Your Own Microbrewery, Distillery, Or Cidery" written by the staff of Entrepreneur Media, Inc. and Corie Brown. The Rum Historian- In this month's article called "American Rum 23: George Washington's Rum Papers”, Marco Pierini talks about George Washington' letters on the importance of rum. Rum in History- A timeline of events that occurred during the month of September throughout history. Exclusive Interview- Margaret Ayala, publisher of "Got Rum?" interviews Mr. Benoit Bail, associate of the Rum Embassy. Eye on Craft: Distillery Safety - This section is aimed at craft distilleries and consumers, bringing awareness to all about the dangers of Urea (CH 4N2O). Cigar and Rum Pairing- Philip Ili Barake brings us a pairing called "Martini Version #2" where he uses two rums, Worthy Park Single Cane Estate Rum from Jamaica and Rhum Bologne Black Cane from Guadalupe, to make a cocktail that he then pairs up with Rothschild Gran Reserva from the Arturo Fuente’s Chateau line. From The Editor- "Rum: The Tropical Attractant" by Luis Ayala. The Angel’s Share - Paul Senft reviews Maggie’s Farm Queen Share Unaged Rum and St. George California Agricole Rum. Cooking with Rum- Chef Susan Whitley shares with us a main course dish called Rum Curried Chicken with Coconut Milk and for dessert some delicious Coconut-Pecan Macaroons. Bon Appetit! The Rum University - The Rum University shares with us part 15 of a series on "Ideas That Changed the Rum World". This month's topic is barrel toasting and charring. Rum University Laboratory- The Rum University offers a recipe on how to make your own Pineapple-Coconut Rum Cream. Rum University- The Rum University announces its next 5-Day Rum Course which will be held in Louisville, Kentucky at the Moonshine University February 19th - 23rd of 2018. The Muse of Mixology- Cris Dehlavi brings us "Hurricane" where she offers a recipe to make your own Hurricane cocktail along with a recipe to make your own Housemade Grenadine. Cheers! Coconuts- We explore the wonderful world of coconuts. Rum University Library - The Rum University shares an Amazon Kindle review of "Coconut - Milk:Flour:Oil Recipes" written by Jane Burton. The Rum Historian- In this month's article called "American Rum 22: Blood, Sweat and Rum”, Marco Pierini talks about the Revolution and rum's role. Rum in History- A timeline of events that occurred during the month of August throughout history. Exclusive Interview- Margaret Ayala, publisher of "Got Rum?" interviews Mr. Marco Pierini, author and Rum Historian. Paul's Spirited Travel - Paul Senft shares with us a recap of his recent visit to Tales of the Cocktail in New Orleans, Louisiana. Cigar and Rum Pairing - Philip Ili Barake brings us a pairing called "Coconut Fashioned" where he pairs up a cocktail using Botran Solera 18 years rum along with a Coloniales cigar from Trinidad de Cuba. From The Editor- "Rum, The International Spirit" by Luis Ayala. The Angel’s Share - Paul Senft reviews Cedar Ridge Dark Rum and Plantation O.F.T.D. Overproof Rum. Cooking with Rum- Chef Susan Whitley shares with us a main course dish called Rum Curried Pineapple Chicken and for dessert a Pineapple Upside-Down Cake with Rum and Salted Caramel. Bon Appetit! The Rum University - The Rum University shares with us part 14 of a series on "Ideas That Changed the Rum World". This month's topic is Irrigation. Rum University Laboratory- The Rum University offers a recipe on how to make your own Apricot Rum Liqueur. The Muse of Mixology- Cris Dehlavi brings us "Between the Sheets" where she offers a cocktail recipes using white rum, cognac and Curacao. Cheers! Rum University Library- The Rum University shares an Amazon review of "From King Cane To The Last Sugar Mill" written by Allan Jones and Robert V. Osgood, both authors are agricultural scientists. The Rum Historian - In this month's article called "American Rum 21: A Merchantilist's Nightmare”, Marco Pierini talks about the roles of rum, molasses, distillation and barrel manufacturing during the American Revolution. Rum in History- A timeline of events that occurred during the month of July throughout history. Exclusive Interview- Margaret Ayala, publisher of "Got Rum?" interviews Mr. Paul W. Case, Jr., Partner of Kolani Distillers LLC located in Paia, Hawaii. Cigar and Rum Pairing- Philip Ili Barake brings us a pairing called "Straight Pairing" where he pairs up a “Geniales” cigar from Hoyo de Monterrey along with a Rhum Vieux Agricole 2011 from Bielle. From The Editor- "Rum is Culture" by Luis Ayala. The Angel’s Share - Paul Senft reviews Stolen Overproof Rum and Appleton Estate Joy Anniversary Blend. Cooking with Rum- Chef Susan Whitley shares with us a delicious layered cake called Spirited Layered Cake. Bon Appetit! The Rum University - The Rum University shares with us part 13 of a series on "Ideas That Changed the Rum World". This month's topic is Reforestation. Rum University Laboratory - The Rum University offers a recipe on how to make your own Clove Rum Liqueur. Rum University: Campus Voice- Mr. Behr Neighbors, the distilled spirits industry liaison for Luckett & Farley in Louisville, Kentucky, shares with us his recent rum experience during the most recent 5 Day Distillers Course. The Muse of Mixology- Cris Dehlavi brings us "Scorpion" where she offers two delicious cocktail recipes: Trader Vic’s Scorpion Recipe and Dale DeGroff’s Scorpion Recipe. Cheers! Rum University Library- The Rum University shares an Amazon review of "Taste As Experience - The Philosophy and Aesthetics of Food" written by Nicola Perullo. The Rum Historian - In this month's article called "American Rum 20: Rum and Revolution”, Marco Pierini talks about the Sugar Act and its role in the American Revolution. Rum in History- A timeline of events that occurred during the month of June throughout history. Father's Day Special- Margaret Ayala, publisher of "Got Rum?" magazine shares the top 5 ways to feast your Father on his day. Exclusive Interview- Margaret Ayala, publisher of "Got Rum?" interviews Mr. Mark McLaughlin and Mr. Arch Watkins, owners of Old Line Spirits located in Baltimore, Maryland. Cigar and Rum Pairing - Philip Ili Barake brings us a pairing called "Old Pal- Rum Version" where he pairs up a version of the Negroni using Rhum Clément 10 Year Old along with an Epicure N°2 cigar from the Hoyo de Monterrey Reserva line. From The Editor- "Alcohol and the Environment" by Luis Ayala. The Angel’s Share - Paul Senft reviews Lyon Dark Rum and Mount Gay 1703 Master Select. Cooking with Rum- Chef Susan Whitley shares with us two delicious recipes: Rum Pork Tenderloin and Almond Rum Torte. Bon Appetit! The Rum University - The Rum University shares with us part 12 of a series on "Ideas That Changed the Rum World". This month's topic is Barrel Crozing and Chamfering. Rum University Laboratory - The Rum University offers a recipe on how to make your own Golden Plum Rum Liqueur. Mother's Day Special- Here are four great ideas on how you can pamper your rum-lover Mom on her special day. The Muse of Mixology- Cris Dehlavi brings us "Swizzles" where she offers two delicious cocktail recipes: Queens Park Swizzle and Amaro Espresso Swizzle. Cheers! Rum University Library- The Rum University shares a review of "RumRunning and the Roaring Twenties" (written by Philip P. Mason) by Midwest Book Review. The Rum Historian- In this month's article called "American Rum 19: Rum and Mobs”, Marco Pierini talks about how discussions in taverns were soon moved to other locations due to the size of participants that resulted in mobs. Rum in History - A timeline of events that occurred during the month of May throughout history. Paul's Spirited Travel- Paul Senft shares with us his experience travelling to the Midwest Rum Festival. Exclusive Interview- Margaret Ayala, publisher of "Got Rum?" interviews Mrs. Brooke Boak, owner of Drink Tank Ltd. located in California. Cigar and Rum Pairing- Philip Ili Barake brings us a pairing called "Coffee Coffee" where he pairs up a Campana Cubana Cigar, from the Bolivar factory, with a coffee-based cocktail that includes: Rhum Bielle, from Guadalupe, Ron Dictador Insolent, from Colombia, and Vermouth Rosso..
From The Editor- "Elemental" by Luis Ayala. The Angel’s Share - Paul Senft reviews Caribbean’s Finest Gran Reserva Rum and John Emerald Gene’s Spice Flavored Rum. Cooking with Rum- Chef Susan Whitley shares with us a delicious main course called Filet Mignon with Orange, Mushroom and Rum Sauce along with a dessert to compliment the meal, Caramel and Rum Oranges. Bon Appetit! The Rum University - The Rum University shares with us part 11 of a series on "Ideas That Changed the Rum World". This month's topic is Pumps. Rum University Laboratory- The Rum University offers a recipe on how to make your own Cinnamon Coffee Rum Liqueur. The Muse of Mixology- Cris Dehlavi brings us "The Jungle Bird" where she offers three different methods to make the cocktail. Cheers! Rum University Library- Margaret Ayala shares the publisher's review of "The Taste Culture Reader: Experiencing Food and Drink" edited by Carolyn Korsmeyer. The Rum Historian- In this month's article called "American Rum 18: The Royal Navy Against America”, Marco Pierini talks about the undefined regulations on proceeds of seized and confiscated ships. Rum in History- A timeline of events that occurred during the month of April throughout history. Rum in the News - Mike Kunetka brings us the most recent and noteworthy news in the rum industry. Eye on Craft- This is chapter II of a series on safety in craft distilleries. In this month's issue we discuss the dangers of Methanol. Cigar and Rum Pairing- Philip Ili Barake brings us a pairing called "The Fiftieth" where he pairs up a Magnum 50 cigar from the H. Upmann portfolio with a Rum Manhattan cocktail using Don Pancho 8 Year Old rum. From The Editor- "Transitional March" by Luis Ayala. The Angel’s Share - Paul Senft reviews Ron Cihuatán Solera 12 Reserva Especial and Copper Bottom Silver Rum. Cooking with Rum- Chef Susan Whitley shares with us a delicious recipe called Spiced Rum Glazed Peach Shortcakes. Bon Appetit! The Rum University - The Rum University shares with us part 10 of a series on "Ideas That Changed the Rum World". This month's topic is vacuum distillation. Rum University Laboratory - The Rum University offers a recipe on how to make your own orange flavored rum. 2017 Rum University 5-Day Rum Course - The Rum University shares some highlights of its recent 5-Day Rum Course which took place February 20th- 24th at The Moonshine University in Louisville, Kentucky. The Muse of Mixology- Cris Dehlavi brings us "Homemade Syrups" including three recipes: Basic Simple Syrup, Blueberry Mint Simple Syrup and Pistachio Orgeat. Cheers! Rum University Library- Margaret Ayala shares the publisher's review of "Making Sense of Taste" written by Carolyn Korsmeyer. The Rum Historian- In this month's article called "American Rum 17: The French Connection”, Marco Pierini talks about the connection between France and the US colonies. Rum in History - A timeline of events that occurred during the month of March throughout history. Exclusive Interview- Margaret Ayala, publisher of "Got Rum?" magazine, interviews Mr. Jeremy Craig, Co-Founder and Head Distiller of Copper Bottom Craft Distillery located in Holly Hill, Florida. Cigar and Rum Pairing- Philip Ili Barake brings us a pairing called "Farewell to a Great One" where he pairs up a Samaroli Demerara 1990 rum with a Partagás Serie D N°6 cigar from Cuba. From The Editor- "Cacao, Chocolate and Rum" by Luis Ayala. The Angel’s Share - Paul Senft reviews EXTE Rum SR (Spiced & Rich) and Three Howls Gold Rum. Cooking with Rum- Chef Susan Whitley celebrates Valentine's Day with two chocolate-based recipes: Decadent Chocolate Biscuits and Easy Chocolate Frosting. Bon Appetit! Rum University Library- Margaret Ayala reviews "Chocolate: Pathway To The Gods" written by Meredith L. Dreiss and Sharon Edgar Greenhill. The Rum University - The Rum University shares with us part 9 of a series on "Ideas That Changed the Rum World". This month's issue is about laboratory equipment and the invention of the Spectrophotometer. Rum University Laboratory- The Rum University offers a recipe on how to make your very own Cacao Rum Tincture. 2017 Rum University 5-Day Rum Course - The Rum University will have its 5-Day Rum Course this month from February 20th- 24th at The Moonshine University in Louisville, Kentucky. The Muse of Mixology- Cris Dehlavi brings us "Chocolate Rum Cocktails" where she offers two chocolate-based cocktails to help you celebrate Valentine's Day with your loved one: Dark Chocolate Rum Manhattan and the Mexican Hot Chocolate. Cheers and Happy Valentine's Day! 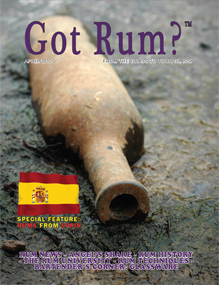 The Rum Historian - In this month's article called "American Rum 16: Smuggling”, Marco Pierini talks about the real truth about smuggling after the Molasses Act and how it was more about the paperwork process than the physical "smuggling" of rum. Special Feature: Valentine's Day- Valentine's Day is just around the corner so here is some interesting information about chocolate, coffee and rum, including some delicious recipes for you Lovers out there looking for something special to help you celebrate. Cigar and Rum Pairing- To celebrate Valentine's Day, Philip Ili Barake brings us a special pairing called "The White and Black Pirate" where he pairs up two cocktail recipes (White Pirate and Black Pirate) with a Churchill by Romeo and Julieta. From The Editor- "Janus and White Rum" by Luis Ayala. The Angel’s Share - Paul Senft reviews Cardinal Spirits Tiki Rum and Bacardí Maestro de Ron. Cooking with Rum- Chef Susan Whitley rings in the new year with: Stuffed Chicken with Rum and Zabaione (Zabaglione) a la Rum. Bon Appetit! Rum University Library- Margaret Ayala reviews "Traditional Fermented Food and Beverages For Improved Livelihoods" which was published by the Rural Infrastructure and Agro- Industries Division of the Food and Agriculture Organization of the United Nations. The Rum University - The Rum University shares with us part 8 of a series on "Ideas That Changed the Rum World". This month's issue is about laboratory equipment and the invention of the pH meter. Rum University Laboratory- The Rum University offers a recipe on how to make your very own Caraway Rum Liqueur. 2017 Rum University 5-Day Rum Course - The Rum University will have its next 5-Day Rum Course February 20th- 24th at The Moonshine University in Louisville, Kentucky. The Early Bird Special will expire in one week so hurry and register today. The Muse of Mixology- Cris Dehlavi brings us "White Rum Cocktails" where she offers three white rum based cocktails to help you ring in the new year with all of your friends and family: Hemingway Daiquiri, Mojito and El Presidente. Cheers and Happy New Year! reviving of white rums, not as neutral and odorless rums designed for cocktails, but rather as high-quality, rich in aroma and flavor, with a lovely long finish. Eye on Craft: Distillery Safety - This section is aimed at craft distilleries and consumers, bringing awareness to all about the dangers of the use of PVC with Ethanol. Cigar and Rum Pairing - Philip Ili Barake rings in the new year with his pairing called "Delicious" where he pairs up Rhum Blanc Agricole from Maison La Mauny, located in the South of the island of Martinique, along with a Habano from H. Upmann, the Connoisseur A. In this pairing, Philip uses the Rhum Blanc to make a Rum Manhattan cocktail, only this time a bit drier and with no garnish. From The Editor- "The Power of Metaphors" by Luis Ayala. The Angel’s Share - Paul Senft reviews Doorly’s 12 and Don Q 2005. Cooking with Rum- Chef Susan Whitley shares with us two Italian inspired winter/holiday recipes: Cioppino a la Rum and Christmas Cookies. Bon Appetit! The Rum University - The Rum University shares with us part 7 of a series on "Ideas That Changed the Rum World". This month's issue is about Alcohol Proofing, Taxes and the Hydrometer. Rum University Laboratory - The Rum University offers a recipe on how to make your very own Pumpkin Spiced Rum Liqueur. 2017 Rum University 5-Day Rum Course - The Rum University announces its 2017 5-Day Rum Course scheduled for February 20th- 24th at The Moonshine University in Louisville, Kentucky. The Muse of Mixology- Cris Dehlavi brings us "Holiday Cocktails" where she offers three cocktails you are sure to enjoy this holiday season with all of your friends and family: Rosemary Poinsettia, Vanilla Rum Old Fashioned and Spiced Walnut. Cheers! conflicts of the trade relations between the Continental Colonies and the French West Indies and the development of the Molasses Act in response to these confilicts. Holiday Rum Shopping Guide- Mr. Paul Senft shares with us a few great holiday gift ideas for the rum lovers in your lives. Exclusive Interview - Margaret Ayala, publisher for "Got Rum?" 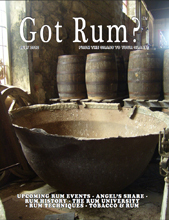 magazine interviews the entire "Got Rum?" team. Cigar and Rum Pairing- In this month's article called "Élégant", Philip Ili Barake pairs up a special edition cigar from Casa del Habano, made by Hoyo de Monterrey called “Elegante” with a rhum agricole called Isautier 10 Year Old from Reunion. From The Editor- "Strength in Diversity" by Luis Ayala. The Angel’s Share - Paul Senft reviews Rhum Saint James Vieux Réserve Privée 12 Year and Trois Rivières VSOP. Cooking with Rum- In this month's issue we are focusing on Rhum Agricoles. In light of this, Chef Susan Whitley shares with us a famous French dessert recipe called Baba au Rhum. Bon Appetit! The Rum University Library - With our focus on Rhum Agricoles, Margaret Ayala offers some recommended books for those interested in learning more about French Rhums. The Rum University - The Rum University shares with us part 6 of a series on "Ideas That Changed the Rum World". This month's issue is about Sugarcane Processing, Pressing and Steam Engines. Rum University Laboratory- The Rum University offers a recipe on how to make your very own Sassafras Rhum Liqueur. The Muse of Mixology- Cris Dehlavi brings us "The Unique Flavors of Rhum" where she offers a Rhum Agricole inspired cocktail called "Rendezvous at Le Marin" which was created by Nigal Vann of M at Miranova. Cheers! The Rum Historian - In his article called "American Rum 14: Guinea Rum”, Marco Pierini talks about rum and slavery in the USA. Around the Rum World- Mr. Carl Kanto takes us on a journey to Tequila, Jalisco, Mexico where there were over 1,200 different spirits entered in the Spirits Selection Competition held by Concours Mondial de Bruxelles. Rhum Agricole Special- "Got Rum?" takes us on a journey into the world of Rhum Agricoles, rums made from sugarcane juice. Exclusive Interview - Margaret Ayala, publisher for "Got Rum?" magazine interviews Mr. Jerry Gitany, Co-Founder of La Confrerie du Rhum, Rum Gazette and The Rum Embassy. Cigar and Rum Pairing - In this month's article called "The Rum Martini", Philip Ili Barake pairs a rum cocktail using 10 Cane from Trinidad and Tobago along with a Series D Number 6 Cigar from Partagas. From The Editor- "Consistency and Change" by Luis Ayala. The Angel’s Share - Paul Senft reviews Lake House Spiced Rum and Baron Samedi Spiced Rum. Cooking with Rum- Chef Susan Whitley shares with us two delicious recipes: Rum Spiced Chili con Carne and Candied Yam Soufflé. Bon Appetit! The Rum University Library - Margaret Ayala reviews "Designing & Building Automatic Stills, Second Edition" written by Riku. The Rum University - The Rum University shares with us part 5 of a series on "Ideas That Changed the Rum World". This month's issue is about Sugarcane Processing, Harvesting and the Mechanical Harvesting. Rum University Laboratory- The Rum University offers a recipe on how to make your very own Rosemary & Tangerine Rum Liqueur. The Muse of Mixology- Cris Dehlavi brings us "Harvest Cocktails" where she offers a fall season inspired cocktail called "Harvest Rum Cocktail". Cheers! The Rum Historian - In his article called "American Rum 13: a Mass Destruction Weapon?”, Marco Pierini continues his discussion about rum and the native American Indians. Halloween Special- Ghostly Lore and Spooky Rum Cocktails. Exclusive Interview - Margaret Ayala, publisher for "Got Rum?" magazine interviews Mr. Yoshiharu Takeuchi, President of Takehiro C. Ltd., producers of Nine Leaves Rums from Japan. Cigar and Rum Pairing- In this month's article called "A Twist on the Mojito Mulato", Philip Ili Barake pairs a rum cocktail using Ron Santero Añejo 11 Years Old Rum along with a Rothschild from Arturo Fuente, from the Gran Reserva line. From The Editor- "Between Vanity and Pride" by Luis Ayala. The Angel’s Share - Paul Senft reviews Rum Fire Overproof Rum and Hamilton Overproof 151 Demerara River Rum. Cooking with Rum- Chef Susan Whitley shares with us two delicious appetizer recipes: Spiked Stuffed Celery and Spirited Mushroom-Stuffed Eggs. Bon Appetit! The Rum University Library - Margaret Ayala reviews "NeuroGastronomy" written by Gordon M. Shepherd. The Rum University - The Rum University shares with us part 4 of a series on "Ideas That Changed the Rum World". This month's issue is about Sugarcane Processing, Water Evaporation and the Multiple-Effect Evaporator. Rum University Laboratory- The Rum University offers a recipe on how to make your very own Spiced Blackberry Rum Liqueur. The Muse of Mixology- Cris Dehlavi brings us "Make Your Own Infusion" where she talks about alcohol infusions and offers a recipe: Spiced Rum Infusion. Cheers! The Rum Historian- In his article called "American Rum 11: The Drunken Indian”, Marco Pierini talks about the effect rum had on native American Indians. Exclusive Interview - Margaret Ayala, publisher for "Got Rum?" magazine interviews Mr. Luca Pirola, Founder of the Bartender.it Network and organizer of The Rum Day in Milan, Italy. Cigar and Rum Pairing- In this month's article called "Cocktail N. 33", Philip Ili Barake pairs a rum cocktail using Elixir 33 (a rum liqueur from Cuba) along with an Epicure Especial “Gordito” Cigar from the Hoyo de Monterrey line. From The Editor- "Following Your Nose" by Luis Ayala. The Angel’s Share - Paul Senft reviews for the first time in "Got Rum?" a Cachaça called Novo Fogo Chameleon as well as Paraiso Rum. Cooking with Rum- Chef Susan Whitley shares with us a delicious recipe: Monte Cristo Rum Sandwich . Bon Appetit! Spirited Coverage: 2016 Tales of the Cocktail - Mr. Paul Senft highlights his days at Tales of the Cocktail in New Orleans, Louisiana. In addition "Got Rum?" congratulates Ms. Cris Dehlavi, who was inducted into the "Dame Hall of Fame". The Rum University - The Rum University shares with us part 3 of a series on "Ideas That Changed the Rum World". This month's issue is about Microbiology, Fermentation and Pasteurization. The Private Label Primer- Part VIII- Luis Ayala, Editor of "Got Rum?" magazine and Rum Consultant, brings us part 8 of a series of articles related to private label development. The Muse of Mixology- Cris Dehlavi brings us "Mojito" where she talks about the history of the Mojito and offers two recipes: Pineapple Mojito and Strawberry Basil Mojito. Cheers! The Rum Historian - In his article called "American Rum 11: The Indian Trade”, Marco Pierini talks about the French and British Empires in America in the mid 1700's and their trades with the American Indians. Exclusive Interview - Margaret Ayala, publisher for "Got Rum?" magazine interviews Mr. Dave Boullé, Rum Maker at Trois Freres Distillery located in the Seychelles. Cigar and Rum Pairing- In this month's article called "Pot Still Negroni", Philip Ili Barake pairs a Negroni (using Mount Gilboa, a pot-stilled rum from Barbados) along with a Cuban cigar called Coloniales, from the Trinidad Factory. From The Editor- "The Chaotic Nature of Change" by Luis Ayala. The Angel’s Share - Paul Senft reviews Antelope Island Rum and Koloa Gold Rum. The Rum University Library- Luis Ayala, Editor of “Got Rum?” magazine, reviews "The Maturation of Distilled Spirits: Vision & Patience" written by Hubert Germain-Robin. Cooking with Rum- Chef Susan Whitley shares with us a delicious recipe for Rum-Glazed Ribs along with a refreshing Louisiana Lemonade cocktail, courtesy of Bayou Rum. Bon Appetit! The Rum University - The Rum University shares with us part 2 of a series on "Ideas That Changed the Rum World". This month's issue is about the Barrel Hooper. The Private Label Primer- Part VII- Luis Ayala, Editor of "Got Rum?" magazine and Rum Consultant, brings us part 7 of a series of articles related to private label development. The Muse of Mixology- Cris Dehlavi, "The Muse of Mixology" for "Got Rum?" magazine, brings us "Plantation Pineapple Rum" where she talks about pineapples and how they were the symbol of hospitality. Cheers! The Rum Historian- In his article called "American Rum 10. Rum in Everyday Life”, Marco Pierini, The Rum Historian, talks about the important role rum played in people's everyday routines from home, work to weddings. Exclusive Coverage- Coverage of the V International Rum Conference & Rum Tasting Competition held in Madrid, Spain. Exclusive Interview - Margaret Ayala, publisher for "Got Rum?" magazine, interviews Mr. Armando Rosario, Director of Mixology for Southern Wine and Spirits. Cigar and Rum Pairing- In this month's article called "Old Mate", Philip Ili Barake pairs up a Cuban Romeo y Julieta Short Churchill Cigar with a vintage bottle of Santa Teresa Selecto Rum from Venezuela. From The Editor- "Trade Currents" by Luis Ayala. The Angel’s Share - Paul Senft reviews Batiste Ecoiste Rhum and Gunroom Rum. Cooking with Rum- Chef Susan Whitley offers us two delicious recipes: Basil & Rum Shrimp and Orange Rum Ice. Bon Appetit! The Rum University - The Rum University shares with us the first of a series on "Ideas That Changed the Rum World". The Private Label Primer- Part VI- Luis Ayala, Editor of "Got Rum?" magazine and Rum Consultant, brings us part 6 of a series of articles related to private label development. Agricultural Focus- The Rum University discusses "Visual Identification of Sugarcane Varieties". The Muse of Mixology- Cris Dehlavi, "The Muse of Mixology" for "Got Rum?" magazine, brings us "The Versatility of Rum" where she takes traditional cocktail recipes that used Bourbon and replaces the Bourbon with Rum. Cheers! The Rum Historian - In his article called "American Rum 9. More About Taverns and Rum”, Marco Pierini, The Rum Historian, talks about the important role Rum played in Taverns, where people gathered to share news and to discuss politics. Exclusive Interview - Margaret Ayala, publisher for "Got Rum?" magazine, interviews Mr. Tim Russell, Founder and Head Distiller of Allegheny Distilling. Cigar and Rum Pairing- In this month's article called "Heavy Pairing", Philip Ili Barake pairs up a Bolivar Belicoso Cigar with a Port Morant Demerara Rum 1999. From The Editor- "Rum: A Melting Pot of Cultures" by Luis Ayala. The Angel’s Share - Paul Senft reviews Puerto Angel Amber Rum and Bumbu Rum. The Rum University Library- Margaret Ayala, Publisher of “Got Rum?” magazine, reviews "Zen and Tonic: Savory and Fresh Cocktails for the Enlightened Drinker" written by Jules Aron. In addition to the book review, Margaret also offers three featured recipes from the book. Cooking with Rum- Chef Susan Whitley offers us two delicious recipes: Rum & Garlic Leg of Lamb and Bubbly Rum Punch. Bon Appetit! The Rum University Laboratory- The Rum University shares with us an easy recipe to make our very own Peppermint & Chocolate Rum Liqueur. Measuring Alcohol- Part V- This is part 5 of a series of articles written by Mr. Gary Spedding, Alcohol Beverage Chemist. The Private Label Primer- Part V- Luis Ayala, Editor of "Got Rum?" magazine and Rum Consultant, brings us part 5 of a series of articles related to private label development. The Muse of Mixology- Cris Dehlavi, "The Muse of Mixology" for "Got Rum?" magazine, brings us "Time for Tea" where she offers some great cocktail recipes using teas. Cheers! The Rum Historian - In his article called "American Rum 8. Taverns”, Marco Pierini, The Rum Historian, talks about the importance of Taverns in New England as public functions, centers for social life and a place where political meetings took place. Rum in the News- Mike Kunetka brings us the most recent and noteworthy headlines in the rum industry. Exclusive Interview - Margaret Ayala, publisher for "Got Rum?" magazine, interviews Mr. Matthew Bailey, Account Manager for Fort Dearborn Company, label printers. Cigar and Rum Pairing - In this month's article called "The President of the Caribbean", Philip Ili Barake pairs up a cocktail called "Presidente" (a rum version of a Manhattan), using Ron Cacique Extra Añejo Leyenda (a rum from Venezuela), along with a Maduro N6 cigar from the Oro lineup of La Flor Dominicana (a cigar from the Dominican Republic). From The Editor- "Rum’s Birth Certificate" by Luis Ayala. The Angel’s Share - Paul Senft reviews Mezan Panama 2006 and Providencia 1878. The Rum University Library- Margaret Ayala, Publisher of “Got Rum?” magazine, reviews "Antique Glass Bottles: Their History and Evolution (1500-1850)" written by Willy Van den Bossche. Cooking with Rum- Chef Susan Whitley offers us two great recipes for this spring season: Final Destination Rum Steaks and Fruit Flambe. Bon Appetit! The Rum University Laboratory - The Rum University shares with us an easy recipe to make our very own Rhubarb Rum Liqueur. Measuring Alcohol- Part IV- This is part 4 of a series of articles written by Mr. Gary Spedding, Alcohol Beverage Chemist. The Private Label Primer- Part IV- Luis Ayala, Editor of "Got Rum?" magazine and Rum Consultant, brings us part 4 of a series of articles related to private label development. The Rum University Agricultural Focus- The Rum University shares with us a "Glossary of Terms" from the sugarcane world, featured cultivar: CP 88-1762. The Muse of Mixology- Cris Dehlavi, "The Muse of Mixology" for "Got Rum?" magazine, brings us "Mary Pickford," taking a step back in history during Prohibition and the development of the famous Mary Pickford cocktail. Cheers! The Rum Historian - In his article called "American Rum 6. Before Jerry Thomas”, Marco Pierini, The Rum Historian, talks about the creation of cocktails, such as, the Punch, Black-Strap, Grog and Toddy, just to name a few. Exclusive Interview - Margaret Ayala, publisher for "Got Rum?" magazine, interviews Mr. Wayne Curtis, a freelance journalist from New Orleans. Upcoming Rum University 5-Day Course - The Rum University and The Moonshine University will have their 5-Day Rum Course April 11th-15th, 2016 in Louisville, Kentucky. Cigar and Rum Pairing - In this month's article called "The New Negronis", Philip Ili Barake pairs up a cocktail called "Camillo In Xela", using Zacapa XO Rum, along with a Partagas Serie D No.6 Cuban cigar. From The Editor- "Branding vs. Marketing in the Rum World" by Luis Ayala. The Angel’s Share - Paul Senft reviews Pusser’s Gunpowder Proof Rum and Banks 7 Rum. The Rum University Library- Margaret Ayala, Publisher of “Got Rum?” magazine, reviews "The Lore of Still Building" written by Kathleen and Norman Gibat. Cooking with Rum- Chef Susan Whitley offers us a main course dish called Chicken and Rum and for dessert an Apple-Rum Spread. Bon Appetit! The Rum University Laboratory - The Rum University shares with us an easy recipe to make our very own Angelica Root Rum Liqueur. Measuring Alcohol- Part III- This is part 3 of a series of articles written by Mr. Gary Spedding, Alcohol Beverage Chemist. The Private Label Primer- Part III- Luis Ayala, Editor of "Got Rum?" magazine and Rum Consultant, brings us part 3 of a series of articles related to private label development. The Muse of Mixology- Cris Dehlavi, "The Muse of Mixology" for "Got Rum?" magazine, brings us "Painkiller," a rich and fruity island favorite cocktail which is a twist on the Piña Colada. Cheers! The Rum Historian - In his article called "American Rum 6: Plentiful, Cheap and Strong”, Marco Pierini, The Rum Historian, continues his search for the origin of rum, exploring the differences between West Indies and American rum. Exclusive Interview - Margaret Ayala, publisher for "Got Rum?" magazine, interviews Mr. Tony Chase, President of the Daufuskie Island Rum Company located on Daufuskie Island, South Carolina. Upcoming Rum University 5-Day Course - The early registration deadline for the 5-Day Rum Course by The Rum University and The Moonshine University is fast approaching. Register today and get FREE hotel, April 11th-15th, 2016 in Louisville, Kentucky. Cigar and Rum Pairing- In this month's article called "Habanosommelier, Master of Masters", Philip Ili Barake does his pairing in Cuba during the Cuban Cigar Festival (Festival del Habano), held at the end of February. Philip's pairing took place before a panel of seven judges. He paired an Old Fashioned cocktail, using Ron Zacapa XO and Smith & Cross, along with a Partagás Maduro No. 1 cigar. From The Editor- "Identity and Personality" by Luis Ayala. The Angel’s Share - Paul Senft reviews Wicked Dolphin Gold Reserve Rum and Mezan Guyana 2005. The Rum University Library- Margaret Ayala, Publisher of “Got Rum?” magazine, reviews “Making Fine Spirits: using simple, easy-to-build gear" written by Zymurgy Bob. Cooking with Rum- Chef Susan Whitley brings us two great rum cake recipes that were generously shared by the fantastic people at Bayou Rum: Bayou Rum Satsuma Cake and Bayou Spiced Rum Cake. Bon Appetit! The Rum University Laboratory- The Rum University shares with us an easy recipe to make our very own Strawberries & Cream Rum Liqueur. Measuring Alcohol- Part II- This is part 2 of a series of articles written by Mr. Gary Spedding, Alcohol Beverage Chemist. The Private Label Primer- Part II- Luis Ayala, Editor of "Got Rum?" magazine and Rum Consultant, brings us part 2 of a series of articles related to private label development. The Rum University Agricultural Focus- The Rum University shares with us a "Glossary of Terms" from the sugarcane world. The Muse of Mixology- Cris Dehlavi, "The Muse of Mixology" for "Got Rum?" magazine, brings us "The Coquito" where she talks about the world of coconuts and shares a delicious Coquito cocktail recipe. Cheers! The Rum Historian - In his article called "American Rum 5. The Cradle of the Giant”, Marco Pierini, The Rum Historian, continues his search for the origin of rum. In this article he talks about the history of molasses and its role in the production of American Rum. Exclusive Interview - Margaret Ayala, publisher for "Got Rum?" magazine, interviews Mr. Seth Dettling, Owner/Lead Distiller of Big Escambia Spirits, LLC located in Atmore, Alabama. Upcoming Rum University 5-Day Course - Early registration for the 5-Day Rum Course by The Rum University and The Moonshine University is fast approaching. Register today and get FREE hotel, April 11th-15th, 2016 in Louisville, Kentucky. Cigar and Rum Pairing - In this month's article called "Vacation Time", Philip Ili Barake pairs up Republic Rum, 8 years old, from St. Maarten with a cigar produced by Damatta from Bahia, Brazil. From The Editor- "Stubbling" by Luis Ayala. The Angel’s Share - Paul Senft reviews Puerto Angel Rum Blanco and St. Lucian Pot Still Aged Rum. 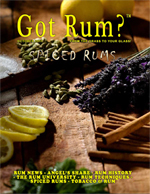 The Rum University Library- Margaret Ayala, Publisher of “Got Rum?” magazine, reviews “Cooking with Caribbean Rum” written by Laurel-Ann Morley. Cooking with Rum - Chef Susan Whitley rings in the New Year with: Rum Marinated Mushroom and Pork Loin with Spiced Rum Soaked Prunes. Bon Appetit! The Rum University Laboratory- The Rum University shares with you an easy recipe to make your very own Pomegranate Rum Liqueur. Measuring Alcohol- Part I- This is part 1 of a series of articles written by Mr. Gary Spedding, Alcohol Beverage Chemist. The Private Label Primer- Part I- Luis Ayala, Editor of "Got Rum?" magazine and Rum Consultant, brings us part 1 of a series of articles related to private label development. The Rum University Agricultural Focus- The Rum university talks about the different varieties of sugarcane for cultivation. The Muse of Mixology - Cris Dehlavi, "The Muse of Mixology" for "Got Rum?" magazine, brings us "Show Me Some PROOF!" where she talks about overproof rums and how they are being used in today’s modern cocktails. Cheers! The Rum Historian- In his article called "American Rum 4. To Kern Rye Out of the Sea Watter”, Marco Pierini, The Rum Historian, continues his search for the origin of rum. In this article he talks about how rum played an important role replacing drinking water, how it was used for medicinal purposes, as well as, serving as rations for sailors. Exclusive Interview - Margaret Ayala, publisher for "Got Rum?" magazine, interviews Mr. Hugo Mesquita, Sales and Marketing Director at Amorim, a cork company, located in Santa Maria de Lamas, Portugal. Upcoming Rum University 5-Day Course - The Rum University and The Moonshine University announce their upcoming five day rum course, April 11th-15th, 2016 in Louisville, Kentucky. Cigar and Rum Pairing- In this month's article called "Cocktail Tasting", Philip Ili Barake’s pairing takes him to Room N°09 at Hotel Vino Tinto (Red Wine Hotel) in the Bellavista neighborhood of Santiago, Chile. He, along with head bartender at Room N°09, Mr. Diego Harris, pair up two rums: Smith & Cross from Jamaica and El Dorado 15 Year Old from Guyana, along with a “Toro” made in the Dominican Republic from H. Upmann called “The Banker”. From The Editor- "On Welcoming Scrutiny" by Luis Ayala. The Angel’s Share - Paul Senft reviews Cartavio 12 and Afrohead XO. The Alchemy of Rum- Presented by The Rum University, this is the final part of a series of articles exploring the magical transformation of rum, from earth elements to a distilled spirit. Cooking with Rum- Chef Susan Whitley brings us some great recipes to help us stay warm this winter season: Onion & Rum Soup and Rum Glazed Peppered Steaks. Bon Appetit! The Rum University Laboratory- The Rum University shares with you an easy recipe to make your very own Black Walnut Rum Liqueur. Holiday Rum Shopping Guide- Paul Senft shares with us some great holiday gift ideas for the rum lovers in your life. Writer's Corner - Luis and Margaret Ayala, publishers of "Got Rum?" magazine, interview Mr. Matthew Rowley on his recent book called "Lost Recipes of Prohibition: Notes from a Bootlegger’s Manual". The Muse of Mixology- Cris Dehlavi, "The Muse of Mixology" for "Got Rum?" magazine, brings us "Appleton Rum- Cane to Cup" where she talks about the oldest rum distillery in Jamaica, its history, products and cocktail recipes. Cheers! The Rum Historian- In his article called "American Rum 3. The Most Flourishing Island" Marco Pierini, The Rum Historian, continues his search for the origin of rum, but this time he takes his journey back to Barbados and their relationship with the mainland colonies. Upcoming Rum University 5-Day Course- The Rum University and The Moonshine University announce their upcoming five day rum course, April 11th-15th, 2016 in Louisville, Kentucky. Around the Rum World- Mr. Carl Kanto gives us a brief overview of the recent Caribbean Rum & Beer Festival that was held on the beautiful island of St. Maarten November 5th-7th, 2015. Exclusive Interview - Margaret Ayala, publisher for "Got Rum?" 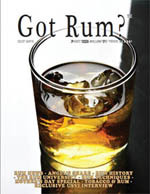 magazine, interviews the entire "Got Rum?" team to recap their experiences/impressions of 2015 and their goals for 2016. Cigar and Rum Pairing- In this month's article called "Back to the Past", Philip Ili Barake's pairing takes him back to "Casa del Habano" in Santiago, Chile, where he pairs up a Petit Robusto Cigar (50 x 102mm) from the Hoyo de Monterrey line with Richland Rum from Georgia, USA. From The Editor- "A Tale of Two Stills" by Luis Ayala. The Angel’s Share - Paul Senft reviews Westerhall 10XO and Facundo Eximo. The Alchemy of Rum- Presented by The Rum University, this is Part 5 of a series of articles exploring the magical transformation of rum, from earth elements to a distilled spirit. Cooking with Rum- Chef Susan Whitley brings us some great recipes from Blue Water Rum, located on the beautiful island of St. Maarten: Rum Pulled Pork (with a Rum BBQ sauce) along with a cocktail to pair with the Pulled Pork called 96 Degrees. Bon Appetit! The Rum University Laboratory- The Rum University shares with you an easy recipe to make your very own Spiced Pecan Rum Liqueur. The Rum University Library- A book review of "Rum, Slaves and Molasses" written by Clifford Lindsey Alderman. This book talks about the Triangular Trade of New England. The Muse of Mixology - With the holiday season just around the corner, along with cooler temperatures, Cris Dehlavi, "The Muse of Mixology" for "Got Rum?" magazine, offers some great cocktail recipes that are sure to put you in the holiday spirit. Cheers! The Rum Historian- In his article called "A Walking Tavern" Marco Pierini, The Rum Historian, continues his search for the origin of rum, but this time he takes his journey to New England in the early 1630's. Rum in the News - Mike Kunetka brings us the most recent and noteworthy headlines in the rum industry. Exclusive Interview - Margaret Ayala, publisher for "Got Rum?" magazine, interviews Mr. Daniel Nunez Bascunan from Copenhagen, Denmark. Cigar and Rum Pairing- In this month's article called "Rapa Nui Experience", Philip Ili Barake's pairing takes him all the way to Easter Island where he pairs up a Puro Limited Edition Flor de las Antillas, from My Father Cigar line, with Zacapa 23 Solera Rum from Guatemala. From The Editor- "Sugar Industry Threatened by Monsters" by Luis Ayala. The Angel’s Share - Paul Senft reviews Rougaroux Full Moon Dark Rum and Bristol Black Spiced Rum. The Alchemy of Rum- Presented by The Rum University, this is Part 4 of a series of articles exploring the magical transformation of rum, from earth elements to a distilled spirit. Halloween Special - Some fun rum-based spooky cocktail recipes along with some fun facts about zombies and pumpkins. Cooking with Rum- Chef Susan Whitley offers two Halloween recipes: Candied Pear Ghosts with (optional) Cinnamon Rum Sauce and Gelatin Brains (Rum Optional). Bon Appetit! The Rum University Laboratory- The Rum University shares with you an easy recipe to make your very own Cinnamon Rum Liqueur. The Rum University Library- "Duppy Stories" was published in 2001, written by David Brailsford and illustrated by John Stilgoe. This book talks about Jamaican ghostly lore. Readers are entertained with this easy to read 138 page book with black and white illustrations. The Muse of Mixology - Cris Dehlavi is our newest "Got Rum?" contributing writer. In this month's article called "DTO" she talks about the Daiquiri, from its inception to modern times. The Rum Historian- In his article called "American Rum!" Marco Pierini, The Rum Historian, delves into the importance that rum had in the Thirteen Colonies. Exclusive Interview - Paul Senft interviews Mr. Tom “Thor” Thordarson, an artist who paints with rum. Around the Rum World- Mr. Carl Kanto gives us a brief overview of the recent 2015 Concours Mondial de Bruxelles Spirts Selection Competition that was hosted by China. Cigar and Rum Pairing- In this month's article called "Not a Competition, Just Fun", Philip Ili Barake takes his pairing all the way to Italy where he and a few friends got together to pair up 3 different cigars with 3 rums. From The Editor- "Innovation and Renovation in the Rum Industry" by Luis Ayala. The Angel’s Share - Paul Senft reviews Kicking Mule Handcrafted Rum and Papagayo Organic Silver Rum. Upcoming Rum University 5-Day Course- The Rum University and The Moonshine University announce their upcoming five day rum course, October 5th-9th, 2015 in Louisville, Kentucky. The Alchemy of Rum- Presented by The Rum University, this is Part 3 of a series of articles exploring the magical transformation of rum, from earth elements to a distilled spirit. Cooking with Rum- Chef Susan Whitley offers two recipes: Sirloin and Rum Meatballs and Peaches a la Rum. Bon Appetit! The Rum University Laboratory- The Rum University shares with you an easy recipe to make your very own Ginger Rum Liqueur. The Rum University Library - Margaret Ayala, Publisher for "Got Rum?" magazine, reviews "La Industria Licorera en Mayagüez, Antigua Capital Mundial del Ron (“The Liquor Industry in Mayagüez, Old Rum Capital of the World”)" written by Mr. Federico Cedó Alzamora. The Rum Historian- In his article called "Cachaza" Marco Pierini, The Rum Historian, continues on his quest to discover the origin of rum where he has to go back to Colonial Brazil (1640). Exclusive Interview - Margaret Ayala interviews Mr. Frank C. Stipes, owner of Rones Superiores de Puerto Rico & Compañia Inc., located in Mayagüez, Puerto Rico. Cigar and Rum Pairing- In this month's article called "Manhattan, Why Not? ", Philip Ili Barake makes a Rum Manhattan using Angostura 1919 Rum (8 years old) from Trinidad & Tobago. He pairs it up with a Robusto BG Meyer Standard Issue cigar from the Camacho line. From The Editor- "Resurrecting Forgotten Rums" by Luis Ayala. The Angel’s Share - Paul Senft reviews Grander Panama Rum and Ron Cartavio XO. The Alchemy of Rum - Presented by The Rum University, this is Part 2 of a series of articles exploring the magical transformation of rum, from earth elements to a distilled spirit. Cooking with Rum- Chef Susan Whitley offers two recipes: Short Ribs a la Rum and Apricot Rum Cream. Bon Appetit! Nuts About The Coconuts- Some fun facts about coconuts plus some coconut inspired cocktail recipes. The Rum University Laboratory- The Rum University shares with you an easy recipe to make your very own Coconut Rum Cream. The Rum University Library - Margaret Ayala, Publisher for "Got Rum?" magazine, reviews "Awesome Coconut Milk Recipes: Tasty Ways to Bring Coconuts from the Palm Tree to Your Plate" written by Nicole Smith. The Rum Historian- In his article called "On the Quest Again 3: Vinum Adustum" Marco Pierini, The Rum Historian, continues on his quest to discover the origin of rum. Paul's Rum Journey- Mr. Paul Senft, a contributing writter for "Got Rum?" magazine and Rum Reviewer for the Angel's Share section of the magazine, takes us on his recent journey to the Dominican Republic and Haiti, an invitation by the West Indies Rum and Spirits Producers’ Association (WIRSPA). Exclusive Interview - Margaret Ayala interviews Mr. Tom KLiebert, owner of River Road Distillery, producers of Kicking Mule Rum. Cigar and Rum Pairing- In this month's article called "Speakeasy Experience", Philip Ili Barake pairs up Ron Centenario 20 Aniversario from Costa Rica with a Liga Privada Unico Feral Flying Pig Cigar from Drew Estate in Puerto Rico. From The Editor- "Rum Alchemy" by Luis Ayala. The Angel’s Share - Paul Senft reviews Mezan XO Rum and Bayou Select Rum. The Rum University Laboratory - The Rum University shares with you an easy recipe to make your very own Lemon & Mint Rum Liqueur. The Rum University Library- Luis Ayala, Editor for "Got Rum?" magazine, reviews "Atlas Du Rhum" written by Mr. Luca Gargano. This book was gifted to Luis by Luca at the recent May 2015 "Congreso Internacional del Ron" in Madrid, Spain. The Bartender's Corner- Dr. Ron A. Ñejo discusses "Calculating Beverage Supplies for a Party". The Alchemy of Rum - Presented by The Rum University, this is Part I of a series of articles exploring the magical transformation of rum, from earth elements to a distilled spirit. Cooking with Rum- Chef Susan Whitley offers two recipes: Frozen Daiquiris Salad and Pink Elephant Parfait. Bon Appetit! The Rum Historian- In his article called "On the Quest Again: 2. Historia Naturalis Brasiliae" Marco Pierini, The Rum Historian, continues on his quest to discover the origin of rum. Exclusive Interview - Margaret Ayala interviews Ms. Bridget Albert, Regional Director of Mixology for Southern Wine & Spirits, about her book called "Market-Fresh Mixology". Cigar and Rum Pairing- In this month's article called "Dictador Rum", Philip Ili Barake pairs up Ron Dictador XO Insolent with a Zino Platinum Z-Class 546 Cigar. From The Editor - "Responsible Rum Revelries" by Luis Ayala. The Angel’s Share - Paul Senft reviews John Watling's Amber Rum and Skotlander Rum III. The Rum University Laboratory- The Rum University shares with you an easy recipe to make your very own Coriander and Cardamom Rum Liqueur. Industry Focus- A letter issued to the Alcohol Beverage Industry by Mr. Gary Spedding, Ph.D, Alcohol Beverage Chemist. IV International Rum Conference - "Got Rum?" exclusive coverage of the recent International Rum Conference that took place in Madrid, Spain along with award results from the tasting competition. Cooking with Rum- Chef Susan Whitley offers two recipes Rum Marinated Ribeye Steaks and Tortoni in Rum. Bon appetit! The Rum Historian- In his article called "On the Quest Again," Marco Pierini, The Rum Historian,picks up where he left off on the quest to discover the origin of rum. New England Tequila & Rum Festival- Paul Senft, writer for "Got Rum?" magazine, gives us coverage about the recent 1st Annual New England Tequila & Rum Festival that took place in Lincoln, Rhode Island. Exclusive Interview - Margaret Ayala interviews Mr. Emiliano Fernandez-Pena, owner of La RonRonEra, a rum bar located in Madrid, Spain. Cigar and Rum Pairing- In this month's article called "Joint Venture", Philip Ili Barake pairs up a Montecristo Espada Cigar from Nicaragua with an El Dorado 15 Year Old Rum from Guyana. From The Editor- "The Congener Conundrum" by Luis Ayala. The Angel’s Share- Paul Senft reviews Afrohead Premium Dark Aged Rum and Siesta Key Toasted Coconut Rum. The Rum University Library- Margaret Ayala reviews "Louisiana Sugarcane Pictorial: From the Field to the Table" written by Ronnie Oliver. The Rum University Laboratory- The Rum University shares with you an easy recipe to make your very own Rosemary & Lavander Rum Liqueur. Mother's Day Celebration- Some great gift ideas for your Mother on her special day, plus a list of all of the countries celebrating this special occassion this month. Bartender's Corner- Dr. Ron A. Ñejo talks about "The Wonderful World of Bitters, Part I" and shares a recipe from Jerry Thomas to make your own Decanter Bitters. Cooking with Rum- Chef Susan Whitley offers two great tropical rum-based recipes Flaming Tropical Sweet & Sour Ham and Tropical Pineapple Flambé. Bon appetit! The Rum Historian- In his article called "A Toxic Beverage," Marco Pierini, The Rum Historian, talks about the poor quality of rum produced in the old days and its affects on the soldiers' health. Cinco de Mayo Celebration- A little background history of "Cinco de Mayo" along with some recipes made with Mexican sugar called "Piloncillo". Exclusive Interview - Margaret Ayala interviews Mr. Luis Alvarez, Master Blender of Ron Cihuatán, the first ever rum made in El Salvador. Cigar and Rum Pairing- In this month's article called "Arturo Fuente Lunch", Philip Ili Barake talks about his recent invitation to join members of "Club Amantes del Buen Puro" located in San Juan Puerto Rico to share in the experience of three fine cigars from the Arturo Fuente line. Philip ends up pairing his cigar of choice with Ron Zacapa 23, a rum from Guatemala. From The Editor- "Of Oak and Tannins" by Luis Ayala. The Angel’s Share - Paul Senft reviews Ron Cihuatán Gran Reserva Solera 8 from El Salvador and Skotlander Rum I from Denmark. The Rum University Library- Margaret Ayala reviews "Wood, Whiskey and Wine: A History of Barrels" written by Mr. Henry H. Work. The Rum University Laboratory- The Rum University shares with you an easy Coffee & Orange Chocolate Rum Liqueur recipe. Bartender's Corner- Dr. Ron A. Ñejo talks about "The Compendium of Bar Measurements and Terms, Part 4" where he shares a collection of glassware photographs to help offer a visual representation of the different types of glasses available in today's bars. Cooking with Rum- Chef Susan Whitley offers two great rum-based recipes that are sure to impress your guests: Spirited Beef Stroganoff for dinner and for dessert an Upside Down Nutty Peaches & Rum Cake. Bon appetit! The Rum Historian- Marco Pierini, The Rum Historian, talks about the daily gill of rum that American soldiers received in his article called "Rum in the Army". Rum Event Coverage- Coverage of The Rum Trade Festival that took place March 6th-7th in Tulum, Mexico. Exclusive Interview - Margaret Ayala interviews Mrs. Elizabeth Jones, Founder of Rum Sisters. Cigar and Rum Pairing- In this month's article called "Early Morning Pairing", Philip Ili Barake pairs up a high altitude coffee from Antigua, Guatemala, a Short Corona cigar from Davidoff from Nicaragua and Zafra Master Reserve 21 Year Old Rum from Panama. From the Editor- "Rum and Bourbon" by Luis Ayala. The Angel’s Share- Paul Senft reviews Facundo Neo Silver Rum and Villa Rica Single Barrel 23 Year Rum. Sugarcane Spirits Around the World- A map of the world that shows where sugarcane spirits (made partially or totally from sugarcane) are being produced. The Rum University Library- Margaret Ayala reviews "Bebidas Mexicanas" written by Martha Chapa. The Rum University Laboratory- The Rum University shares with you an easy Honey Rum Liqueur recipe. Bartender's Corner- Dr. Ron A. Ñejo talks about "The Compendium of Bar Measurements and Terms". This is Part 3 of a series. Cooking with Rum- Chef Susan Whitley offers two great rum-based recipes that are sure to impress your guests: Steak and a Splash of Rum and Flaming Bananas & Rum Delight. Bon appetit! The Rum Historian- Marco Pierini, The Rum Historian, takes you back to the days of the daily tot aboard the Royal Navy ships with his article called "Up Spirits". The Rum Journey's Rum Cruise, Part 3- This is the last of a series of Paul Senft's rum journey. In this article Paul begins his adventures on the island of Dominica, followed by a stop in the Grand Turks and finally traveling to his final destination at the Port of Miama, Florida. Rum in the News- Mike Kunetka brings you the most recent and noteworthy headlines in the rum industry. Exclusive Interview - Margaret Ayala interviews Mr. Leopoldo Molina Ayala, Founder and CEO, producer of Ron Veroes Aged Rums in Venezuela. Cigar and Rum Pairing- In this month's article called "An Orange Summer", Philip Ili Barake pairs up a Nicaraguan Belicoso cigar from the Oliva family, a Serie V Ligero Especial, along with Santa Teresa Rhum Orange Liqueur from Venezuela. From the Editor- "The Truth About Sugarcane Waste" by Luis Ayala. The Angel’s Share- Paul Senft reviews Plantation 3 Stars and Rhum Damoiseau Virgin Cane Rum. Romantic Rum Cocktails- Here are some great romantic cocktails for you and your loved one to enjoy this Valentine's Day. The Rum University Library- Margaret Ayala reviews "Vintage Spirits and Forgotten Cocktails" written by Ted Haigh (aka “Dr. Cocktail”). The Rum University Laboratory- The Rum University brings us a little background information on the "Mamajuana" along with a recipe so you can make your very own rum aphrodisiac. Bartender’s Corner- Dr. Ron A. Ñejo continues his article, Part 2, on "The Compendium of Bar Measurements and Terms". Cooking with Rum- Chef Susan Whitley offers two great recipes for Valentine’s Day: Chocolate Cream Pots and Berries in Champagne & Rum. The Rum Historian- Our Rum Historian, Marco Pierini, talks about the history behind “Grog”. 2014 Rum Journey Rum Cruise- This is a continuation of 2014 Rum Journey’s rum cruise highlights. In this issue, Paul Senft talks about their visits to Martinique and Grenada. Exclusive Interview- Margaret Ayala, Publisher of "Got Rum?" magazine interviews Mr. Brian Christensen, Editor and Publisher of Artisan Spirit magazine. Cigar & Rum Pairing- Rather than doing his usual cigar and rum pairing, this month Mr. Philip Ili Barake takes us on a travel guide through Cuba where he recommends hotels to stay at, places to visit, rums to taste, how to differentiate between a good and fake Cuban cigar and ultimately how to experience the Cuban culture in his article called “Cuba”. From the Editor- "A Taste of Things to Come" by Luis Ayala. The Angel’s Share- Featuring Brinely Coffee Rum and Koloa Kaua’i Spiced Rum, reviews done by Paul Senft. The Rum University Library- Margaret Ayala reviews “The Drunken Botanist” written by Amy Stewart. The Rum University- The Rum University's next class will be held in Louisville, Kentucky at the Moonshine University. Sign up today for the Early Bird Special! Space is limited and seats are going fast. The Rum University Laboratory- The Rum University offers instructions on how to make your very own Bay Rum Aftershave. Rum Event- An interview with Mr. Carlos Alonso Borrego, Director of the Rum Trade Festival, which will be held in Tulun, Mexico on March 6th-7th, 2015. Bartender’s Corner- Dr. Ron A. Ñejo brings us “The Compendium of Bar Measurements and Terms, Part 1”. Cooking with Rum- Chef Susan Whitley offers two rum-based recipes: Lentils & Rum Soup and Lamb Chops with Tomato and Rum Sauce. The Rum Historian- Our Rum Historian, Marco Pierini, brings us the story behind “The Beginning of Navy Rum”. Rum Journey- Highlights of the November 2014 Rum Cruise that set sail from the port of San Juan, Puerto Rico, article written by Paul Senft. Cigar & Rum Pairing- Philip Ili Barake brings us "Anniversary Pairing" where he pairs up Botran Reserva rum from Guatemala with a Dominican Reublic Toro cigar from the Aniversario 107 line up from La Aurora. From the Editor- "End of Year Wrap-Up" by Luis Ayala. The Angel’s Share- Featuring Brugal XV Ron Reserva Exclusiva Rum, Dancing Pines Cask Barrel Aged Rum, Blue Chair Bay Banana Rum and Facundo Exquisito Rum, reviews done by Paul Senft. Bartender’s Corner- Dr. Ron A. Ñejo talks about Early American Rum Cocktails (Part 12) and shares with us a recipe called Royal Punch, from Jerry Thomas' Bartenders Guide, 1862. Rum Lab- The Rum University answers the question about wether or not one should heat up their rum. Holiday Hot Rum Cocktails- Here are a few warm cocktails to help you through this winter season. The Rum Historian- Our Rum Historian, Mr. Marco Pierini from Tuscany, Italy, brings us the story behind “The Sugar (and Rum) Lobby”. 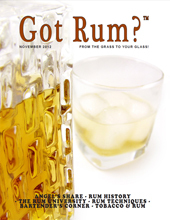 Rum in the News- Our contributing writer for "Got Rum?" 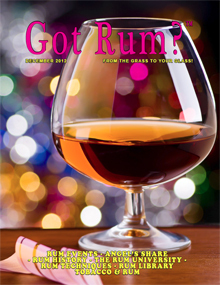 magazine, Mr. Mike Kunetka, brings us the most recent and noteworthy headlines in the rum industry. Exclusive Interview- Margaret Ayala, Publisher of "Got Rum?" 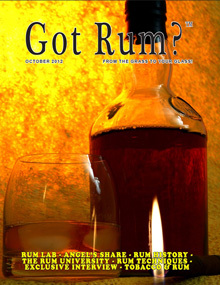 magazine interviews the "Got Rum?" Team. Pairing Tobacco & Rum - Mr. Philip Ili Barake brings us "I Love the Smell of Cigars & Rum in the Morning" where he pairs up a Caroni 12 year old rum with a Churchill Perdom Cigar from the Champagne Sun Grown line. From the Editor- "Approaching the Finish Line" by Luis Ayala. The Angel’s Share- Featuring The Real McCoy 12 Year Old Rum and Origenes Reserva Especial 18 Years Old, reviews done by Paul Senft. Rum Library- Book review of "The Essential Book of Fermentation" written by Jeff Cox, review by Margaret Ayala, Publisher. The Rum University- The Rum University's next class will be held in Louisville, Kentucky at the Moonshine University. Sign up today for the "Early Bird Special"! Bartender’s Corner- Dr. Ron A. Ñejo talks about Early American Rum Cocktails (Part 11) and shares with us a recipe called Hot Brandy and Rum Punch, from Jerry Thomas' Bartenders Guide, 1862. The Importance of Sugar- Some fun and interesting facts about Sugar. The Rum Historian- Our Rum Historian, Mr. Marco Pierini from Tuscany, Italy, brings us the story behind “Punch”. Exclusive Interview- Margaret Ayala, Publisher of "Got Rum?" magazine interviews Ms. Maggie Campbell, Head Distiller for Privateer Rum. Pairing Tobacco & Rum - Mr. Philip Ili Barake brings us "The Essence of Aging" where he pairs up a Dos Maderas 5+5 rum with a Camacho Triple Maduro Robusto Cigar. From the Editor- "Sugar's Bitter Journey" by Luis Ayala. The Angel’s Share- Featuring Pumpkin Face Reserve Rum and Rougaroux 13 Pennies Praline Rum, reviews done by Paul Senft. Spooky Cocktails- Some great Halloween cocktails. The Rum University- The Rum University's next class will be held in Louisville, Kentucky at the Moonshine University. Bartender’s Corner- Dr. Ron A. Ñejo talks about Early American Rum Cocktails (Part 10) and shares with us a recipe called Pine-Apple Punch, from Jerry Thomas' Bartenders Guide, 1862. Upcoming Rum Event- the 4th German Rum Festival will be held in Berlin October 4th-5th, 2014. The Rum Historian- Our Rum Historian, Mr. Marco Pierini from Tuscany, Italy, talks about “Rum and Wellness in XVIII Century Britain”. Exclusive Interview- Margaret Ayala, Publisher of "Got Rum?" magazine interviews Ms. JoAnn Elardo, Founder of Cape Spirits Inc., producers of Wicked Dolphin Rum. Pairing Tobacco & Rum - Mr. Philip Ili Barake brings us "The Walking Dead Pairing" where he and Luis Felipe Cruz pair up their Rocky Patel cigars with their Zombie cocktail. From the Editor- "Rum, The Noble Spirit" by Luis Ayala. The Angel’s Share- Featuring Real McCoy 3 Year Old Rum and Siesta Key Spiced Rum Distiller’s Reserve, reviews done by Paul Senft. Sugarcane, Nutrition and Health- A few fun facts about Sugarcane. Louisiana Sugar Facts- Some facts about sugar from Louisiana. Rum Library- Margaret Ayala, Editor of "Got Rum? ", reviews "Fifty Plants that Changed the Course of History" written by Bill Laws. Bartender’s Corner- Dr. Ron A. Ñejo talks about Early American Rum Cocktails (Part 9) and shares with us a recipe called English Rum Shrub, from Jerry Thomas' Bartenders Guide, 1862. The Rum University- Information about the upcoming 5-Day VIP Rum Training that will be held in Round Rock, Texas November 3rd- 7th, 2014. The Rum Historian- Our Rum Historian, Mr. Marco Pierini from Tuscany, Italy, talks about “Rum Conquers the British Domestic Market”. Exclusive Interview- Margaret Ayala, Publisher of "Got Rum?" magazine interviews Ms. Nancy Fraley, Principal of Nosing Services, a distilled spirits consulting firm. Pairing Tobacco & Rum - Mr. Philip Ili Barake brings us "Japanese Craft Pairing" where he joins Luis and Margaret Ayala in Texas to pair up two Japanese Rums by Nine Leaves, Hitachino Nest Beer XH (8%) and three different cigars that each one chose: Hops Craft Beer Cigar, San Cristobal Elegancia Imperial and a Robusto 3x3. From the Editor- "Penny Wise and Pound Foolish" by Luis Ayala. The Angel’s Share- Featuring Koloa Kaua’i Coconut Rum and Kuknat Coconut Rum, reviews done by Paul Senft. Facts About Coconuts- Some fun facts about coconuts. Coconut Recipe- Featuring a cocktail recipe called "Coco Escondido" (Hidden Coconuts). The Rum University- Coverage of a 5-Day Distiller Course held at the Moonshine University in Louisville, Kentucky, USA and the upcoming 5-Day VIP Rum Training to be held in Round Rock, Texas in November 2014. Bartender’s Corner- Dr. Ron A. Ñejo talks about Early American Rum Cocktails (Part 8) and shares with us a recipe called Rocky Mountain Punch from Jerry Thomas' Bartenders Guide, 1862. Rum Event- Coverage of the "World Cup of Spirits" held in Florianopolis, Brazil, coverage by Carl Kanto. The Rum Historian- Our Rum Historian, Mr. Marco Pierini from Tuscany, Italy, talks about “British Rum Making in the Eighteenth Century”. Exclusive Interview- Margaret Ayala, Publisher of "Got Rum?" magazine interviews Mr. Donald Michael Booth, Master Blender/Distiller of Blue Chair Bay Rums. Pairing Tobacco & Rum - Mr. Philip Ili Barake brings us "Locos por los Cocos" (Crazy for Coconuts) where he pairs up a Costa Rican Peaberry coffee, a vanilla dark chocolate from Italy, an Arango Sportsman Vanilla 200s cigar, Blue Chair Bay Coconut Spiced Rum and Sangster’s Old Jamaica Coconut Rum. From the Editor- "Rum's Coming of Age" by Luis Ayala. The Angel’s Share- Featuring Don Pancho Orígenes 8 and Tiburón Rum, reviews done by Paul Senft. Rum Event- Coverage of the third annual International Rum Conference in Madrid, Spain. Bartender’s Corner- Dr. Ron A. Ñejo talks about Early American Rum Cocktails (Part 7) and shares with us a recipe called Black Stripe from Jerry Thomas' Bartenders Guide, 1862. The Rum Historian- Our Rum Historian, Mr. Marco Pierini from Tuscany, Italy, talks about “Wills, Provisions and Stills”. Rum in the News- Our contributing writer to "Got Rum?" 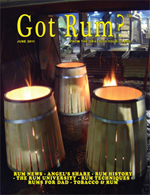 magazine, Mr. Mike Kunetka, brings us the most recent and noteworthy headlines in the rum industry. Exclusive Interview- Interview with Mr. Bradley Tuyn, Founder of Tico Libre Holdings, LLC producers of “Libre Rum & Cola®". Pairing Tobacco & Rum - Mr. Philip Ili Barake brings us "Limited 2013 Cigar Pairing" where he pairs up a Limited Edition 2013 “Romeo de Luxe” Romeo & Juliet Cigar with a Ron Zacapa 2013 Reserva Limitada Rum. From the Editor- "Rum's Treacherous Journey" by Luis Ayala. The Angel’s Share- Featuring Bayou Spiced Rum and Caña Brava, reviews done by Paul Senft. Rum Event- International Rum Conference's schedule in Madrid, Spain June 3rd-4th, 2014. Bartender’s Corner- Dr. Ron A. Ñejo talks about Early American Rum Cocktails (Part 6) and shares with us a recipe called Mississippi Punch from Jerry Thomas' Bartenders Guide. The Rum Historian- Our Rum Historian, Mr. Marco Pierini from Tuscany, Italy, brings us the history of rum in the three great colonial empires. This month's article is called "Rum Among Three Empires". Exclusive Interview- Interview with Mr. Benoît Bail, creator and owner of Zwazo Rums. Pairing Tobacco & Rum - Mr. Philip Ili Barake brings us "Number 15" where he pairs up a Rocky Patel 15th Anniversary Robusto cigar with a Ron Varadero Añejo 15 year old rum. From the Editor- "The Fight for Rum" by Luis Ayala. The Angel’s Share- Featuring Captain Bligh XO Special Reserve Rum and High Wire Silver Rum, reviews done by Paul Senft. Bartender’s Corner- Dr. Ron A. Ñejo talks about Early American Rum Cocktails (Part 5) and shares with us a recipe from the late General Ford, commanding engineer at Dover, called "Punch á la Ford". The Rum Historian- Our Rum Historian, Mr. Marco Pierini from Tuscany, Italy, continues his story from his visit in Barbados bringing us "A Journey to Barbados 3 - Why Rum?". Rum Library- A book review of "Apothecary Cocktails:Restorative Drinks from Yesterday and Today" written by Warren Bobrow, review by Paul Senft, rum reviewer for "Got Rum?". Exclusive Interview- Interview with Mr. Dave Otis (Tiki Dave), Founder ofTaboo Tiki Brands, LLC located in Carson City, Nevada, producers of Kahakai Tiki Rums. Pairing Tobacco & Rum - Mr. Philip Ili Barake brings us "A Gastronomic Experience" where he uses Plantation Grenada 2003 Rum in his Bolognese sauce for his Spaghetti dish and pairs it up with a Camacho cigar from Honduras. From the Editor- "The Quest for the Truth" by Luis Ayala. The Angel’s Share- Featuring Denizen Merchant Reserve Rum, Kahakai Coconut Spiced Rum, Wicked Dolphin Florida Spiced Rum and Roble Viejo Ultra Añejo Rum, reviews done by Paul Senft. Bartender’s Corner- Dr. Ron A. Ñejo talks about Early American Rum Cocktails (Part 4) and how knickerbockers became so popular, hence the development of a Knickerbocker cocktail. The Rum Historian- Our Rum Historian, Mr. Marco Pierini from Tuscany, Italy, continues his finds during his visit in Barbados bringing us "A Journey to Barbados 2- Museums, Library and Archives". Rum Library- Book review of "Caribbean Rum: A Social and Economic History" written by Frederick H. Smith, review by Marco Pierini, Rum Historian. Exclusive Interview- Interview with Mr. Clinton Waynne Wyness, Director of North Shore Trading located in South Africa and part owner of Zulu Rum. Pairing Tobacco & Rum - Mr. Philip Ili Barake brings us "Cocktail Revolution", a unique pairing of two cocktails, Old Fashion (using Zacapa 23) and a Manhattan (using El Dorado Single Barrel EHP), paired up with an H. Upmann Half Corona Cigar. From the Editor- "Speakeasies" by Luis Ayala. The Angel’s Share- Featuring Brugal Especial Extra Dry Rum and Blue Chair Bay Coconut Spiced Rum, reviews done by Paul Senft. Bartender’s Corner- Dr. Ron A. Ñejo talks about Early American Rum Cocktails (Part 3) and of the famous bartender, Jeremiah "Jerry" P. Thomas, along with a recipe for "Tom and Jerry". The Rum Historian- Last month our Rum Historian, Mr. Marco Pierini from Tuscany, Italy, was traveling in Barbados on his continued quest for "The Origin of Rum". This month he brings us "A Journey to Barbados- Part I: Drax Hall". 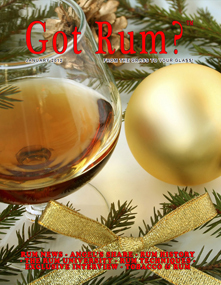 Rum in the News- Join our newest contributing writer to "Got Rum?" magazine, Mr. Mike Kunetka, as he gives us the latest news of rum throughout the world. Rum in History- A timeline of what happened in the month of March throughout history from 1484– 1917. Exclusive Interview- Interview with Mr. Trey Litel, President of Louisiana Spirits LLC, home of Bayou Rum, located in Lacassine, Louisiana. Pairing Tobacco & Rum - Mr. Philip Ili Barake brings us "Illegality", a pairing that began with Padrón Serie 6000 Cigar from Nicaragua and Don Pancho 18 Rum from Panama and ended with an H Upmann Habano at La Casa del Habano in Santiago, Chile. Philip was accompanied by Nicolás Rojas, manager of La Casa del Habano, for this pairing. From the Editor- "Distilled How Many Times?" by Luis Ayala. The Angel’s Share- Featuring Selvarey Cacao Rum and Kahakai Tiki Banana Spiced Rum, reviews done by Paul Senft. Bartender’s Corner- Dr. Ron A. Ñejo talks about Early American Rum Cocktails along with a recipe for "Hot Milk Punch". Rum Cocktails for Lovers- Since we are in the month of romance and love is in the air we want to share with you some great cocktails for lovers. The Rum Historian- This month our Rum Historian, Mr. Marco Pierini from Tuscany, Italy, is traveling in Barbados on his continued quest for "The Origin of Rum". He will be back next month with some updates of his further explorations in the rum world. Rum in History- A timeline of what happened in the month of February throughout history from 1477– 1979. Exclusive Interview- Interview with Mr. Massimo Righi, owner of Whisky Antique, located in Modena, Italy and his brands are Silver Seal and Sestante Collection. Pairing Tobacco & Rum - Mr. Philip Ili Barake brings us "Cold Thinking", a pairing between Rocky Patel Private Cellar Torpedo Cigar from Nicaragua and Ron Pampero Aniversario Rum from Venezuela. From the Editor- "Copper Thieves" by Luis Ayala. The Angel’s Share- Featuring Thomas Tew Single Barrel Rum and Cockspur 130 Overproof Rum, reviews done by Paul Senft. Bartender’s Corner- Dr. Ron A. Ñejo talks about Early American Rum Cocktails along with a recipe for "Hot Rum Flip". The Rum Historian- "The Origin of Rum- A Quest, Part Six: The Forgotten Empire" by Mr. Marco Pierini from Tuscany, Italy. Writer's Corner- An interview with Mr. Dunbar (DC) Campbell, author of "Blood of Belvidere". Rum Industry Certification Program- The first ever certification program to ensure consumers are protected and are getting high quality rum. Rum in History- A timeline of what happened in the month of January throughout history from 1474– 1799. Exclusive Interview- Interview with Mr. Pennfield (Penn) Jensen and Ms. Leah Hutchinson from American Craft Distillers Association (ACDA). Pairing Tobacco & Rum - Mr. Philip Ili Barake brings in the new year with "New Beginning", a pairing between Papa's Pilar Dark 24 Year Old Rum and a Lancero Cigar from the Arturo Fuente collection from the Dominican Republic. From the Editor- “2013 Year End Review" by Luis Ayala. The Angel’s Share- Featuring Ron Barceló Imperial 30 Year Old Rum and George Bowman Rum, reviews done by Paul Senft. Winter Cocktails- Some traditional winter rum cocktails to help you stay warm during the holiday season. The Rum University- The 2014 Course Schedule. The Rum Historian- "The Origin of Rum- A Quest, Part Five: Back to Richard Ligon" by Mr. Marco Pierini from Tuscany, Italy. Rum Event- Coverage of the Caribbean Rum & Beer Festival held in Grenada. Rum in History- A timeline of what happened in the month of December throughout history from 1654– 1980. Exclusive Interview- Interview with Marco Pierini and Francesco Rufini from BarBagnoRoma, which operates under the brand name La Casa del Rum (The House of Rum). Pairing Tobacco & Rum - Mr. Philip Ili Barake bring us "Cast Away". This pairing was done by no other than the "Got Rum?" crew: Luis Ayala (Publisher/Editor), Paul Senft (Rum Reviewer for the "Angel's Share") and Philip. This pairing included Mount Gay Eclipse Rum from Barbados, Angostura 1824 Rum from Trinidad and Double Coronas Cigar from Hoyo de Monterrey from Cuba. Rum Library- Book review by Luis Ayala of "Il Grande libro dei Rum” (The Big Book of Rum) written by Mr. Davide Staffa. From the Editor- “Prohibition" by Luis Ayala. The Angel’s Share- Featuring The Real McCoy 5 Year Old Rum and Mount Gay Black Barrel Rum, reviews done by Paul Senft. William McCoy- A foreword of The Real McCoy, by Frederic F. Van de Water. The Rum Historian- "The Origin of Rum- A Quest, Part Four: What, Who, Where, When?" by Mr. Marco Pierini from Tuscany, Italy. The Rum University- The December 2013 Course Schedule- VIP classes only. Bartender's Corner- Dr. Ron A. Ñejo talks about the Rum Runner cocktail. Rum in History- A timeline of what happened in the month of November throughout history from 1504– 1981. Pairing Tobacco & Rum- Mr. Philip Ili Barake bring us "The Navy Tradition". This pairing brings together a rum from Barbados and a cigar from the Dominican Republic. This month, Philip pairs together Mount Gay 1703 Rum and Perfecxion X from the Arturo Fuentes Opus X line. Rum Library- Book review by Margaret Ayala of "Making Fine Spirits: using simple, easy-to-build gear" written by Zymurgy Bob. Cooking with Rum- A recipe by Betty Crocker: Pumpkin Cheesecake with Caramel Rum Sauce. From the Editor- “Micro Still, Mega Plan" by Luis Ayala. The Angel’s Share- Featuring El Dorado Spiced Rum and Deadhead Gold Rum, reviews done by Paul Senft. The Rum Historian- "The Origin of Rum- A Quest, Part Three: A Missionary in Martinique" by Mr. Marco Pierini from Tuscany, Italy. Ghostly Lore- Find out some of the most popular beliefs regarding evil spirits. Spooky Cocktails- Here are some great cocktail recipes to help you spice up your Halloween party. Exclusive Interview- Interview with Mr. Erick Lewko, Director of Sales, Old New Orleans Rum, located at 2815 Frenchmen Street in New Orleans, LA. Rum in History- A timeline of what happened in the month of October throughout history from 1637– 1900. Pairing Tobacco & Rum – Mr. Philip Ili Barake bring us "Oliver and Cuba". White Rum: Around the World- this month we post the final results to last month's trivia. Rum Cake Reviews- Reviews of Olde Savannah Rum Cakes and Rum Cake Lounge's Gluten Free Vanilla Bean Rum Cake. From the Editor- “From Ethanol to Rum” by Luis Ayala. The Angel’s Share- Featuring Naked Turtle Rum and Wicked Dolphin Rum, reviews done by Paul Senft. White Rums - Around the World. Bartender's Corner- Dr. Ron A. Ñejo talks about "Researching the ‘Ti Punch" and also about "Essential Rum Cocktail #4: ‘Ti Punch". The Rum Historian- "The Origin of Rum- A Quest, Part Two: Barbados in 1647: Sugar, Slavery and Rum" by our new addition to "Got Rum?" magazine, Mr. Marco Pierini from Tuscany, Italy. Exclusive Interview- Interview with Mr. Craig Adcock, owner of Jude’s Rum Cake (KC, NOLA and Key West) and Belly Up BBQ – based in Kansas City. Rum in History- A timeline of what happened in the month of September throughout history from 1522– 1883. Pairing Tobacco & Rum– Mr. Philip Ili Barake bring us “The Highest Pairing”. This pairing literally takes place at an altitude of 7900 ft. in La Parva,a region in Chile. The pairing consist of a Drew Estate Liga Privada Unico Feral Flying Pig Cigar and Zacapa Solera 23 Rum from Guatemala. Rum Library - Margaret Ayala's book review of “America Walks into a Bar”. From the Editor- “The Tree of Life” by Luis Ayala. Tiki Special- Paul Senft brings us some great Tiki cocktails. The Angel’s Share- Featuring Kahakai Original Tiki Spiced Rum and Blue Chair Bay Coconut Rum, reviews done by Paul Senft. Bartender's Corner- Dr. Ron A. Ñejo talks about "Researching the Piña Colada" and also about "Essential Rum Cocktail#3: Piña Colada". The Rum Historian- "The Origin of Rum- A Quest, Part One: Richard Ligon's Journey" by our new addition to "Got Rum?" Magazine, Mr. Marco Pierini from Tuscany, Italy. Exclusive Interview- Interview with Mr. Jim Sargent, Founder of Haleakala Distillers in Makawao, Maui, Hawaii. Rum in History- A timeline of what happened in the month of August throughout history from 1492– 1740. Pairing Tobacco & Rum– Mr. Philip Ili Barake pairs up with Mr. Eduardo Molina, owner of Tea Studio located in Santiago, Chile to bring us “Tea Time”. They bring forth teas, infusions, rums and a cigar for this pairing. Here is the line up: Ceylan, Kenilworth Estate OP1 is paired with Rhum Santa Teresa Orange Liqueur from Venezuela; Rooibos from South Africa is paired with Dos Maderas Rum From Spain/Caribbean; Georgia BOPF, from Georgia is paired with Angostura 1824 Rum from Trinidad & Tobago; Christmas Tea is paired up with Ron Zacapa XO from Guatemala and last but not least, Russian Caravan is paired with Rhum J.M Blanc from Martinique. All of the above are paired with a Vintage 2003 Coronas Cigar from the Sancho Panza line. Rum Library - Review of “Trader Vic's Rum Cookery & Drinkery” by Margaret Ayala. From the Editor- “Rum and Literature” by Luis Ayala. Hemingway Special - "The Man, The Legend"
The Angel’s Share- Featuring Papa's Pilar Blonde Rum and Papa's Pilar Dark Rum, reviews done by Paul Senft. Bartender's Corner- Dr. Ron A. Ñejo talks about "Essential Rum Cocktails- Part II". Rum Event- Coverage of the II International Rum Conference, Madrid, Spain. Exclusive Interview- Interview with Mrs. Kelly Railean, founder of the American Rum Association (ARA). Rum in History- A timeline of what happened in the month of July throughout history from 1521– 1855. Rum Library- Review of “Bar Florida Cocktails"
Pairing Tobacco & Rum– Mr. Philip Ili Barake brings us “A Good Story”, featuring the "Short Story" cigar from the Arturo Fuente Hemingway line and a Daiquiri created by Mr. Luis Felipe Cruz, Bar Manager at the Hotel Noi in Santiago, Chile. From the Editor- “On Choosing Quality Over Fantasy” by Luis Ayala. The Angel’s Share- Featuring Depaz Blue Cane Rhum Agricole from Martinique and Centenario 20 from Costa Rica, review done by Paul Senft. Father's Day Special- 5 Ways to Feast Your Father on His Day, by Margaret Ayala. Rum Event- Interview with Mr. Javier Herrera, Director of II International Rum Conference, Madrid, Spain. Exclusive Interview- Interview with Mr. Jay Maltby, President of Hemingway Rum Company from Palm Beach Gardens, Florida, USA. Rum in History- A timeline of what happened in the month of June throughout history from 1509– 1851. Bartender's Corner- Dr. Ron A. Ñejo talks about "Essential Rum Cocktails- Part I". Rum Library- Review of “Cordial Waters: A Compleat Guide To Ardent Spirits Of The World” written by Volodimir Pavliuchuk. Pairing Tobacco & Rum– Mr. Philip Ili Barake brings us “Puerto Rican Style”, featuring: Ron del Barrilito 3 Star Rum, Bacardi Reserva Limitada Rum, Don Q Gran Añejo Rum and El Morro, San Cristobal de la Habana. From the Editor- “Alembic Allure” by Luis Ayala. The Angel’s Share- Featuring Bacardi Pineapple Fusion (70-Proof), review done by Paul Senft and The Lash Spiced Rum (70-Proof), review done by Margaret Ayala. Mother's Day Special- 4 ways to pamper Mom on her day by Margaret Ayala. Exclusive Interview- Interview with Cellar Master, Mr. Charles Roberts, with La Favorite Distillery in Martinique. Rum in History- A timeline of what happened in the month of May throughout history from 1502– 1832. Rum Library- Review of “Rum & Contemporary Cuisine” written by Carlton Grooms and Geoffrey Blythe. Pairing Tobacco & Rum– Mr. Philip Ili Barake brings us “The Sweetest Thing”, featuring: Hacienda Saruro Rum Liqueur from Venezuela and a Vintage 2003 Vitola Coronas Cigar by Sancho Panza from Cuba. Exclusive Interview- Interview with Mr. Robert M. "Bob" Gunter, President & CEO of Koloa Rum Company, located in Kalaheo, Kaua’i, Hawai’i, USA. Angel's Share - Reviews of Elements 8 Platinum Rum, Pink Pigeon Original Rum, Below Deck Coffee Rum, Castaway Spiced Rum. Rum Library - Review of "Sugar and Slaves"
Due to website migration, there is NO January 2013 issue of "Got Rum?" From the Editor- “2012: Year End Review” by Luis Ayala. New and Improved- "Got Rum?" website is going to have a new look and feel for 2013. Take a sneak preview of some of the changes you will see. The Angel’s Share- Featuring Castaway Rum (80-Proof), Clément Premiére Canne Rhum (80-Proof), Pirate’s Grog (75-Proof) and RonDiaz Gran Reserva Spiced Rum (70-Proof). Rum Event in Grenada- Coverage of the 3rd Annual Caribbean Rum & Beer Festival held at the Grand Anse Cultural Centre in Grenada November 2nd and 3rd. Rum Cake Reviews- Review of rum cakes from around the world, including: Auntie's Rum Cakes, Jude's Kansas City Rum Cake, Koloa Dark Rum Cake, Rum Cake Lounge's Double Chocolate French Roast, Pusser's Premium British Navy Rum Cake, Rum Runners Traditional and Chocolate Rum Cakes and Tortuga Rum Cakes (Original, Coconut and Key Lime). Rum Library - Review of “Journey to above the clouds” written by René van Hoven. Rum in History- A timeline of what happened in the month of December throughout history from 1654 – 1980. Rum Event in Italy- Coverage of the first ever "Rum in Rome" rum festival held in Rome, Italy written by Leonardo Pinto. The Rum University- Lesson 12 of 12 of the Rum University’s latest course “The History and Science of the Barrel, Lesson 12: Choosing the Perfect Barrel For Your Rum”. Rum Techniques- The Organoleptic Assessment of Rum- Part 21. Pairing Tobacco & Rum –Mr. Philip Ili Barake brings us “Yippie-Ki-Yay”, featuring: El Dorado 21 Years Old Rum from Guyana and “Chubby Especial” from Zino Platinum’s Crown Series Cigars from the Dominican Republic. From the Editor- “Is Immitation Really a Form of Flattery?” by Luis Ayala. Rum Library - Review of “Ron de Venezuela” written by Rosanna Di Turi. Bartender’s Corner- Read what Dr. Ron A. Ñejo has to say about Party Management. The Angel’s Share- Featuring Elements Eight Barrel Infused Exotic Spices (80-Proof), Mount Gay 1703 Old Cask Selection Rum (86-Proof),Rhum J.M Agricole Blanc (100-Proof) and Smuggler's Notch Single Barrel Rum (80-Proof). Trend Setting Rums Part II – This is a continuation from last year’s view of what we consider to be trend setting rums. This section features the following rums: Ron Santa Teresa Selecto from Venezuela, Mount Gay Eclipse Rum from Barbados, Havana Club 3 Year Old Rum from Cuba and Captain Morgan Original Spiced Rum produced by Diageo in various locations. The Rum University- Lesson 11 of 12 of the Rum University’s latest course “The History and Science of the Barrel, Lesson 11: Soleras, Single Barrels and Specialty Barrels”. Rum Techniques- The Organoleptic Assessment of Rum- Part 20. Pairing Tobacco & Rum –Mr. Philip Ili Barake brings us “Something to Remember”, featuring: Ron Santiago 11 Years Old from Cuba and Robusto Avo Signature cigar from the Dominican Republic. From the Editor- “Are Spiced Rums Really Spiced?” by Luis Ayala. The Angel’s Share- Featuring Sea Island Spice Rum (70-Proof), Rondiaz 93 Spiced Rum (93-Proof), Newfoundland Screech Rum (80-Proof) and Admiral Vernon’s Old J Spiced Rum (70-Proof). International Rum Conference- Coverage of the awards ceremony of the First International Rum Conference and Competition in Madrid, Spain which took place on September 13, 2012 at the Hotel Silken Puerta de América. Spooky Cocktails- Halloween themed rum cocktails, courtesy of RedRum. The Rum Lab- Recipe and directions on how to make your very own spiced rum. Exclusive Interview- Interview with Mr. Phil Prichard, owner of Prichard’s Distillery, Inc. located in Kelso, Tennessee. Rum Library- Book review of “Traditional Distillation Art & Passion” by Hubert Germain-Robin. The Rum University- The History and Science of the Barrel, Lesson 10: Oak Alternatives, Unacceptable Shortcuts. Rum Techniques- The Organoleptic Assessments of Rum- Part 19. Pairing Tobacco & Rum– Mr. Philip Ili Barake brings us “First Class Pairing”, a pairing he feels is suitable for connoisseurs. Featuring: El Dorado 15 Year Old Rum from Guyana and Flying Pig Double Figurado, a series of Feral Flying Pig, from Nicaragua. From the Editor- “Rum’s Cycle of Life” by Luis Ayala. Bartender’s Corner- Read what Dr. Ron A. Ñejo has to say about “Is Older Always Better?”. The Angel’s Share- Featuring Starr Ultra Superior Light African Rum (80-Proof), Clément Créole Shrubb Liqueur D’Orange (80-Proof), Plantation Extra Old Barbados Rum (80-Proof) and Appleton Jamaican Independence Reserve (90-Proof, 50 Year Old). Exclusive Interview- Interview with Mr. Mike Jakle and Mr. Willis “Miles” Ponder IV , owners of South Congress Distillery, producers of White Hat Rum from Manor, Texas. The Rum University- The History and Science of the Barrel, Lesson 9: Rum Transformation Inside The Barrel. Rum Techniques- The Organoleptic Assessments of Rum- Part 18. Pairing Tobacco & Rum –Mr. Philip Ili Barake brings us “The Warm Hour”, a pairing he feels is a winter season experience. Featuring: Emilio Hidalgo Santa Anna Pedro Ximenez Sherry , Botrán Reserve Rum from Guatemala and Padrón 1964 Series Imperial cigar. From the Editor- “Grenada: Island of Spice and Enchantment” by Margaret Ayala. Upcoming Spirits Events- Notices of upcoming spirits events throughout the world. Exclusive Interview- Interview with the organizers of the Caribbean Rum & Beer Festival, Cheryl Collymore and Dr. Glyn Williams. 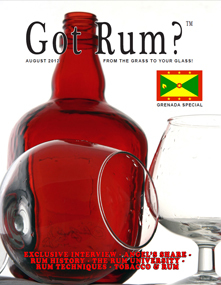 Coverage of Grenada - coverage of the rum distilleries, Grenada's local cuisine, festivals, places to visit and rum tasting sessions at the Blue Bay Resorts & Villas. Rum in History- A timeline of what happened in the month of August throughout history from 1492 – 1740. The Rum University- The History and Science of the Barrel, Lesson 8: Toasting and Charring. Rum Techniques- The Organoleptic Assessments of Rum- Part 17. Pairing Tobacco & Rum – Mr. Philip Ili Barake will take you on a journey of rum, cigar and culinary experience with a fantastic pairing called "Dinner Out". Featuring Edmundo of Montecristo cigar, an appetizer with Legendario 7 Year Old rum from Cuba, the main course with Clément 10 year old Rhum Agricole from Martinique and the dessert with Zacapa XO rum from Guatemala. From the Editor- “Rum Masters At Work” by Margaret Ayala. The Angel’s Share- Featuring White Hat Premium Texas Rum (80 Proof), Old Ipswich Greenhead Spiced Rum (80 Proof), Santa Teresa Claro Rum (80 Proof) and Ron Diaz Coconut Barbados Rum (42 Proof). International Rum Conference- Coverage, awards and results from the International Rum Conference & Rum Tasting Competition in Madrid, Spain that took place June 6th through June 9th. Rum in History- A timeline of what happened in the month of July throughout history from 1521 – 1855. Bartender’s Corner- A discussion with Dr. Ron A. Ñejo about glassware. The Rum University- The History and Science of the Barrel, Lesson 7: Components and Manufacture of the Barrel. Rum Techniques- The Organoleptic Assessments of Rum- Part 16. Coming Up Next- A sneak preview of what "Got Rum? "TM will be covering in the months of August and September. Pairing Tobacco & Rum – A new addition to “Got Rum?”, Mr. Philip Ili Barake, Sommelier by trade, will be covering this section of the magazine bringing to you his recommendations for pairing cigars and rums. 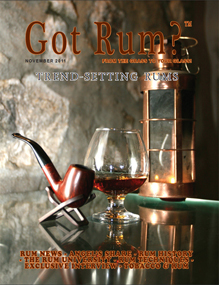 In this issue Mr. Barake features Rocky Patel Torpedo Vintage 1999 cigar and Pyrat Rum XO Reserve. From the Editor- “Enduring Spirits” by Luis Ayala. The Angel’s Share- featuring No. 0 Ron Añejo Guatemala ( 76 Proof), Brinley Gold Shipwreck Spiced Rum (72 Proof), Plantation Rum Original Dark Overproof (146 Proof) and Sea Island Gold Rum (80 Proof). Exclusive Interview- interview with Mr. Alexander Gabriel, President of Cognac Ferrand. Father's Day - Check out the top 5 ways to feast your Father on his day. Rum in History- a timeline of what happened in the month of June throughout history from 1509 – 1851. The Rum Lab- How to make your very own Papaya Rum. A Great gift for Dad this month. The Rum University- The History and Science of the Barrel, Lesson 6: Curing the Wood. Here we will discuss the importance of wood curing. Rum Techniques- the Organoleptic Assessments of Rum- Part 15. Coming Up Next- a sneak preview of what "Got Rum? "TM will be covering in the months of July and August. Pairing Tobacco & Rum - featuring La Preferencia cigar by Garo Habano and Havana Club's Selección de Maestro Rum. From the Editor- “Rum Is On The Rise” by Margaret Ayala. The Angel’s Share- featuring Rhum J.M Rhum Vieux 1997 (96 Proof), Appleton Estate 12 (86 Proof), Sammy's Beach Bar Rum (80 Proof) and Deco Ginger Rum (80 Proof). American Distilling Institute- 9th Annual Craft Distilling Confernece: Focus on Whiskey & Rum held in Louisville, KY and at the Starlight Distillery in Starlight, Indiana. The Supper Club- an Austin, Texas based supper club featuring rum for the evening from cocktails and appetizers to main courses and desserts. Mother's Day - 4 ways to pamper your Mother this month with some great rum themed gifts. The Rum Lab- How to make your very own rum cream liqueur. Great gift for Mom this month. Rum in History- a timeline of what happened in the month of May throughout history from 1502 – 1832. Exclusive Interview- interview with Master Blender Mr. Arnaud de Trabuc of Banks 5 Island Blend Rum. The Rum University- this is Lesson 5 of 12, “Understanding Tannins”. Here we will discuss the contributions of tannins for aged rums. Rum Techniques- the Organoleptic Assessment of Rum- Part 14. Coming Up Next- a sneak preview of what "Got Rum? "TM will be covering in the months of June and July. From the Editor- “The Joy of Returning to Your Roots” by Margaret Ayala. Rum in the News- summary of rum related news from the month of March. The Angel’s Share- featuring Ron Arehucas 7 Select Rum (80 Proof), Ron Añejo Arehucas Reserva Especial (80 Proof), Ron Artemi 7 Reserva (75 Proof), Ron Añejo Dos Maderas P.X. 5+3 (80 Proof), Ron Aldea 75 Aniversario Gran Reserva (80 Proof), Ron Aldea Gran Reserva Familia (80 Proof), Ron Montero Gran Reserva (80 Proof), Montero Ron Palido (80 Proof), Guajiro Ron Miel Canario (60 Proof) and Guanche Ron Licor de Miel (40 Proof). Highlights of Spain- festivals, places to visit and things to do in Spain. Sangrias and Zurras- refreshing beverages that are very popular in Spain. A Culinary Treasure- in this section we focus on the most popular dishes found throughout Spain. The Rum University- this is Lesson 4 of 12 where we discuss “Chemical Properties of Oak”. Here we will discuss oak barrels and the source of their flavors. The Bartender's Corner- Dr. Ron takes you through Part IV of how to host the perfect cocktail party. He will be discussing how to select your glassware. This is a continuation from March’s issue. The Spirits Business- results from the Rum Masters 2012 event that took place last month in the UK. Rum Techniques- the Organoleptic Assessment of Rum- Part 13. Coming Up Next- a sneak preview of what "Got Rum? "TM will be covering in the months of May and June. Pairing Tobacco & Rum- featuring Don Pancho Reserva Especial 2006 cigar and Nº. 0 Ron Añejo Guatemala. From the Editor- “Romancing Rum” by Luis Ayala. Rum in the News- Summary of rum related news from the month of February. The Angel’s Share- Featuring Clément Rhum Vieux Agricole V.S.O.P. (80 Proof), Banks 5 Island Rum (86 Proof), Panamonte Reserva Preciosa (80 Proof) and Rum da Madaiera Dourado (80 Proof). The Bartender's Corner- Dr. Ron takes you through Part III of how to host the perfect cocktail party. This is a continuation from January's issue. Rum Library- a book review of "The Compleat Distiller" published by authors Mike Nixon and Mike McCaw. Industry Insider- an exclusive interview with Dr. Frank Ward, Chairman of the West Indies Rum and Spirits Producers Association (WIRSPA). Rum in History- A timeline of what happened in the month of March throughout history from 1484 – 1917. Exclusive Interview- Read what Mr. Robert Peronet, Cellar Master of Rhum Clément from Matinique has to say about rhum agricole. The Rum University- This is Lesson 3 of 12 where we discuss “Physical Properties of Oak”. Here we will discuss cells,, grain coarseness and American vs. French Oak. Rum Techniques- The Organoleptic Assessment of Rum- Part 12. Coming Up Next- A sneak preview of what "Got Rum? "TM will be covering in the months of April and May. Rum in the News- Summary of rum related news from the month of January. The Angel’s Share- Featuring Don Q Gran Añejo (80 Proof), Clement Sirop de Canne, Dos Maderas PX 5+5 (80 Proof) and Deco Distilling Silver Rum (80 Proof). The Rum Lab- The history and making of Mamajuana, a rum aphrodisiac. Rum Aphrodisiacs– this section covers foods that are thought to increase sexual drive or to enhance reproductive ability. Rum Cocktails for Lovers- we offer some rum cocktails in celebration of Valentine’s Day. Featured Bar- showcasing Lebensstern Bar located in Berlin, coverage courtesy of Javier Herrera our “Got Rum?” correspondent. Rum in History- A timeline of what happened in the month of February throughout history from 1477 – 1979. Exclusive Interview- Read what Paola Medina, Master Blender of Dos Maderas from Spain has to say about rum. The Rum University- We will now be focusing on the history and science of the barrel. This is Lesson 2 of 12 where we discuss “Why Oak?”. Rum Techniques- The Organoleptic Assessment of Rum- Part 11. Coming Up Next- A sneak preview of what "Got Rum? "TM will be covering in the months of March and April. From the Editor- “Rum and Sustainability” by Luis Ayala. Rum in the News- Summary of rum related news from the month of December. 2011 Rum Wrap Up- Noteworthy 2011 Trends. The Angel’s Share- Featuring Plantation 2000 Trinidad Rum (84 Proof), Koloa Kaua’I Dark Hawaiian Rum (80 Proof), Appleton Estate Reserve Jamaica Rum (80 Proof) and Cypress Creek Reserve Vanilla Flavored Rum (80 Proof). The Rum Art Gallery- This section features a rum-related art piece. This month we are featuring a photograph of a mural by famous Cuban painter, Enrique Garcia Cabrera. The mural is located inside the private bar of Ron Havana Club, Plaza de la Catedral in Havana, Cuba. Exclusive Interview- After almost ten years since our last interview, we welcome back Master Blender Joy Spence, from Kingston, Jamaica with J. Wray and Nephew Limited, producers of Appleton rum products. Rum in History- A timeline of what happened in the month of January throughout history from 1474 – 1799. Bartender’s Corner—A discussion with Master Bartender Ron A. Ñejo on how to host the perfect cocktail party- Part II. This is a continuation from last month’s article. The Rum University- We will now be focusing on the history and science of the barrel. In Lesson I we discuss the art of cooperage. Rum Techniques- The Organoleptic Assessment of Rum- Part 10. Coming Up Next- A sneak preview of what "Got Rum?" will be covering in the months of February and March. Pairing Tobacco & Rum- Featuring H. Upmann 1844 Reserve cigar and Ron Pampero Aniversario Añejo rum. 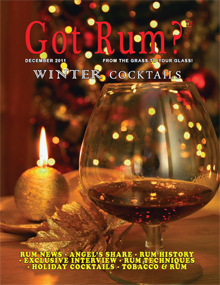 The Editor’s Page- “A Great Year For Rum" by Luis Ayala. World Rum News- Summary of rum related news from the month of November. Exclusive Interview- Interview with Mr. Nazaire Cantous, Master Blender of Rhum J.M from Martinique. The Angel’s Share- Featuring Cockspur Fine Rum (Aged Reserve Rum, 80-Proof), Rhum J.M V.S.O.P. (90-Proof), Railean Small Cask Single Barrel Reserve (80-Proof) and Whistling Andy Hibiscus-Coconut Rum (80-Proof). Holiday Rum Cocktails- some nice holiday rum recipes sure to keep you warm during the winter season. Rum Lab- Making your very own Mexican Eggnog, Rompope. Bartender’s Corner—A discussion with Master Bartender Ron A. Ñejo on how to host the perfect cocktail party- Part I. In Memory of George Robinson- this is the Eulogy of our dearly beloved George Robinson, Master Blender of El Dorado Rum from Guayana. He will truly be missed! Coming Up- A sneak preview of what "Got Rum?" magazine will be covering in the months of January and February. Tobacco and Rum- Featuring GR Tabacaleras Unidas- Gran Habano Limited 2004 cigar and Holey Dollar Extra Aged Overproof rum. The Editor’s Page- “Communicating Through Rum" by Luis Ayala. World Rum News- Summary of rum related news from the month of October. Upcoming Events- Notices of upcoming spirits events throughout the world. German Rum Festival- Berlin- Event held in Berlin October 8th-9th by the Berlin Rum Club. Coverage of this event was generously provided to us by Javier Herrera,President of Rum Club International in Madrid, Spain. The Angel’s Share- Featuring Dos Maderas 5+3 (80-Proof), Rhum J.M Gold Rum (100-Proof), Cypress Creek Reserve Crystal Rum (80-Proof) and Plantation Rum Barbados 5 Years Old (80-Proof). Exclusive Interview- Interview with Master Blender Francisco J. Fernandez Perez of Panama. Trend-Setting Rums- Featuring Pampero Aniversario from Venezuela, El Dorado 15 from Guyana and Zacapa Centenario Solera 23 from Guatemala. Rum In History- A timeline of what happened in the month of November throughout history from 1504 – 1981. The Rum University- This month we look at the Classifications of Rum- Part 8. Rum Techniques- Covering the Organoleptic Assessment of Rum- Part 8. Coming Up- A sneak preview of what "Got Rum?" magazine will be covering in the months of December and January. Tobacco and Rum- Featuring Carlos Toraño Exodus 1959- 50 Years cigar and English Harbour Aged Antigua rum. The Editor’s Page- “Infusions, Percolations and Macerations" by Luis Ayala. World Rum News- Summary of rum related news from the month of August. The Angel’s Share- Featuring VooDoo Spiced Rum (70-Proof), Old New Orleans Cajun Spice Rum (80-Proof), Cruzan 9 Spiced Rum (80-Proof) and Koloa Kaua’I Spice Rum (88-Proof). The Rum Lab- recipe for making a spiced rum. Spooky Cocktails- great Halloween cocktail recipes furnished by RedRum. Rum In History- What happened in the month of October throughout history from 1637 – 1900. Bartender's corner- Dr. Ron A. Ñejo looks at conduct behind the bar. Featured Rum Book- written by none other than our publishers, Luis and Margaret Ayala. The Rum University- This month we look at the Classifications of Rum- Part 7. Rum Techniques- Covering the Organoleptic Assessment of Rum- Part 7. Coming Up- A sneak preview of what "Got Rum?" magazine will be covering in the months of November and December. Tobacco and Rum- Featuring Davidoff Puro d’Oro Eminentes cigar and Brugal Añejo rum. 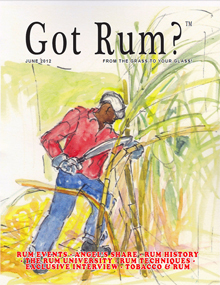 The Editor’s Page- “White Rum or Sugarcane Vodka?” by Luis Ayala. Rum Tasting and Seminar- Premier rum event for Panama Red Rum at Hemingway's Island Grill restaurants in Estero and Pensacola Florida. The Angel’s Share- Featuring Railean Texas Gulf Coast White Rum (80-Proof), Koloa Kaua’I White Rum (80-Proof), Whistling Andy White Rum (80-Proof) and Ron Ricardo White Rum (80-Proof). The Importance of White Rums- Join us as we explore the foundation of all rums, white rums. Rum In History- What happened in the month of September throughout history from 1522 – 1883. USA Craft Rum Distilleries- a list of all rum distilleries throughout the United States. Exclusive Interview- Interview with Mr. Peter Laurie about his rum book titled "The Barbadian Rum Shop: The Other Watering Hole". The Rum University- This month we look at the Classifications of Rum- Part 6. Rum Techniques- Covering the Organoleptic Assessment of Rum- Part 6. Coming Up- A sneak preview of what "Got Rum?" magazine will be covering in the months of October and November. Tobacco and Rum- Featuring Arturo Fuente Hemingway Short Story cigar and Panama Red Overproof rum. The Editor’s Page- “Rum Responsibilities” by Luis Ayala. World Rum News- Rum news that occurred in the month of July. The Angel’s Share- Featuring Cockspur 12 Bajan Crafted Rum (80-Proof), Pecan Street Rum (80-Proof), Kaua'I Gold Hawaiian Rum (80-Proof) and Ricardo Dark Rum (80-Proof). 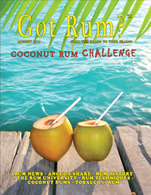 Coconut Rum Challenge- Featuring the Most Complex, Smoothest Pleasure, Boldest Taste and Most Aromatic. Exclusive Interview- Interview with Mr. Roberto Garcia Botran, President of Industrias Licoreras de Guatemala. Rum In History- What happened in the month of August throughout history from 1492 – 1740. The Rum University- This month we look at the Classifications of Rum- Part 5. Rum Techniques- Covering the Organoleptic Assessment of Rum- Part 5. Tobacco and Rum- Featuring Ashton Majesty 6 x 56 cigar and Cruzan Single Barrel rum. The Angel’s Share- Featuring Siesta Key White Rum (80-Proof), Panama Red (108-Proof), Railean Texas Gulf Coast Rum Reserve XO (80-Proof) and Sweet Georgia Belle Prichard's Peach Mango Rum (70-Proof). 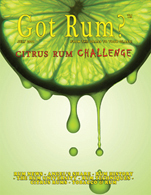 Citrus Rum Challenge- Featuring the smoothest sipper rum, the most versatile rum, the freshest aroma rum and last but not least, the fruitiest tasting rum. Rum Event Coverage- Coverage of MIX: Celebrate Texas Cocktails. Exhibits by: Graham Barnes Distilling, makers of Treaty Oak Platinum Rum, The Spirit of Texas, makers of Pecan Street Rum and Railean Distillers, makers of Texas White, Reserve XO and Small Cask Reserve rums. Bartender's Corner- Meet our newest member, Dr. Ron A. Ñejo. He is happy to answer questions on topics ranging from mixology to relationships and etiquette. The Rum Lab- Ingredients and instructions on how to make your very own Lime Rum Liqueur. Coming Up in "Got Rum? "- A preview of the next two issues of "Got Rum?". Make sure to submit your products and ads in the issues that best suit you. Tobacco and Rum- Featuring Zino Z-Class Series 654-T cigar and Flor de Caña 18 Years Old rum. Rum Library- review of "Cuba: The Legend of Rum"
The Angel’s Share- featuring BlackBeard Spiced Rum (86-Proof), Holey Dollar Rum Extra Aged Over-proof (114.4 Prrof, 3 years old), Ron Viejo de Caldas Grand Reserve Oak Cask Aged Rum (8 years old, 80-Proof) and Ron Barceló Gran Platinum (75 Proof).